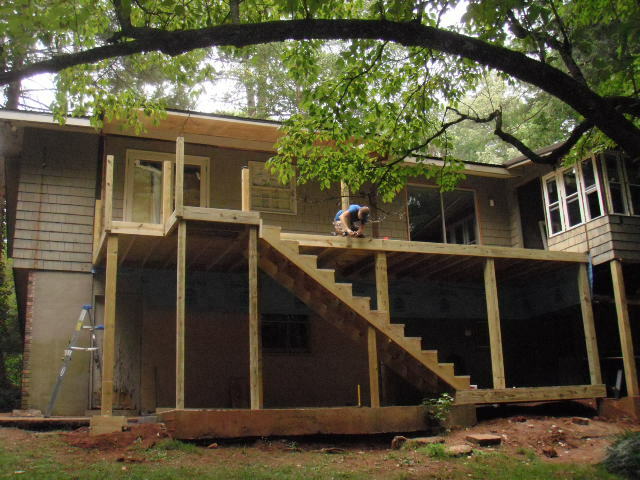 From framing to finish work, our talented craftsmen can satisfy all your general contracting needs. 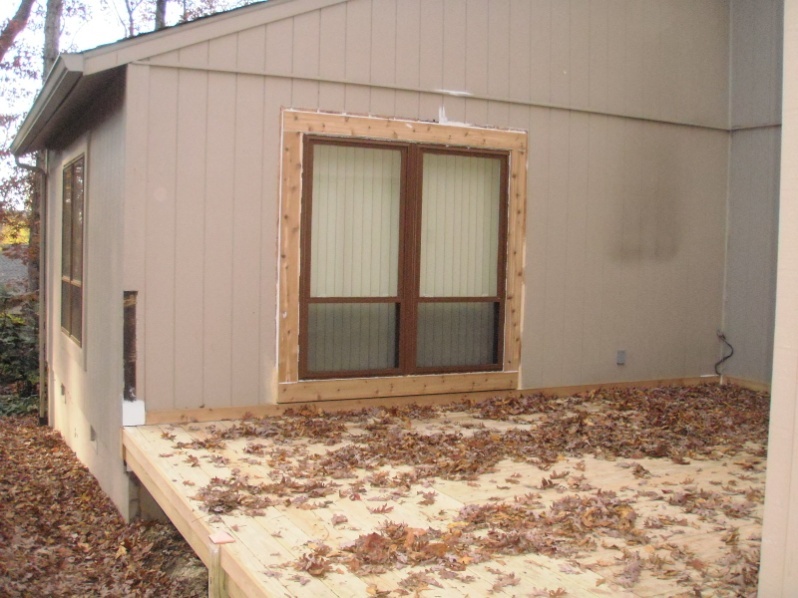 Our knowledge and experience includes green building methods and materials such as advanced framing, ENERGY STAR windows and doors, flooring, cabinetry, and wood and composite siding and trim. 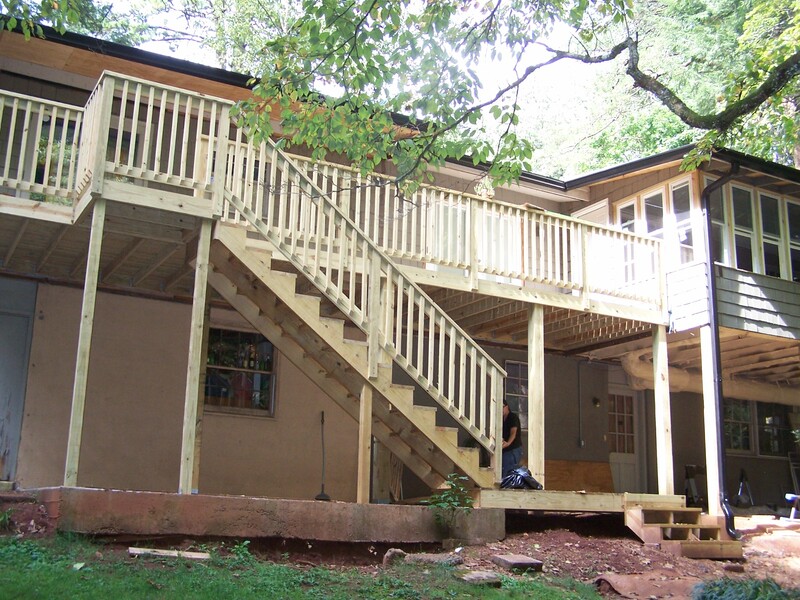 The following project summaries are examples of some of our work. 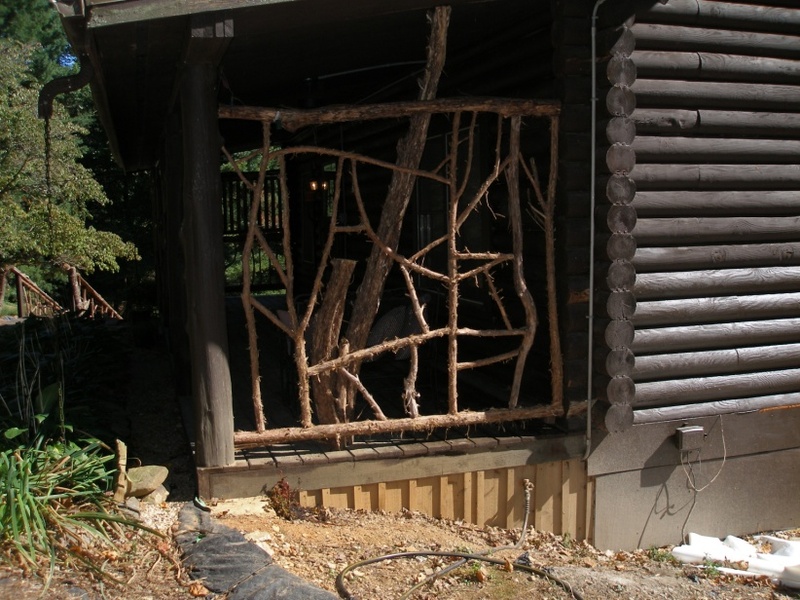 Provide Structural Support. 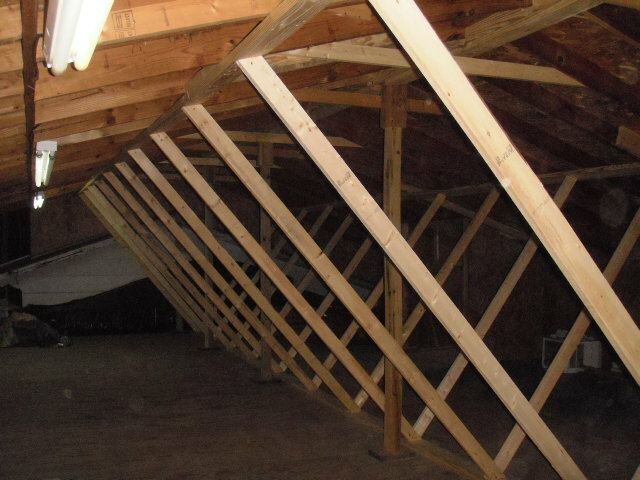 The original trusses had been removed from this home in order to make the attic area more open for storage. 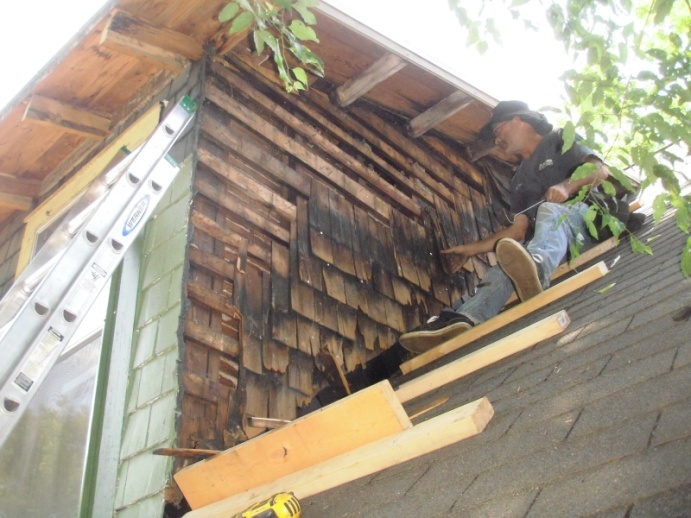 Unfortunately, the work was not structurally sound and the entire roof system was unstable. 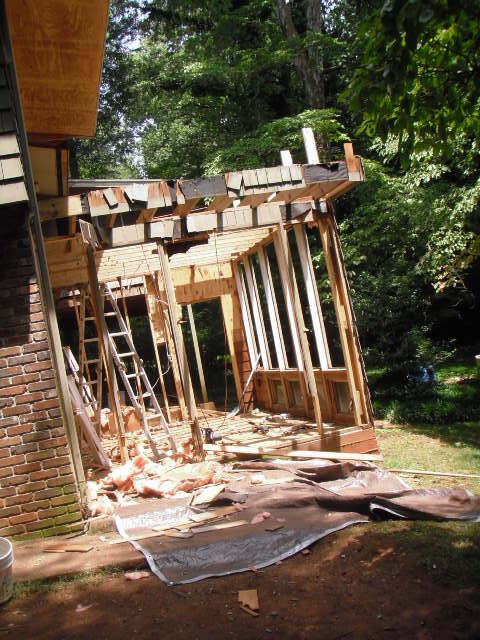 Supports were added to stabilize the structure and provide for adequate transfer of the roof load to the underlying framing. 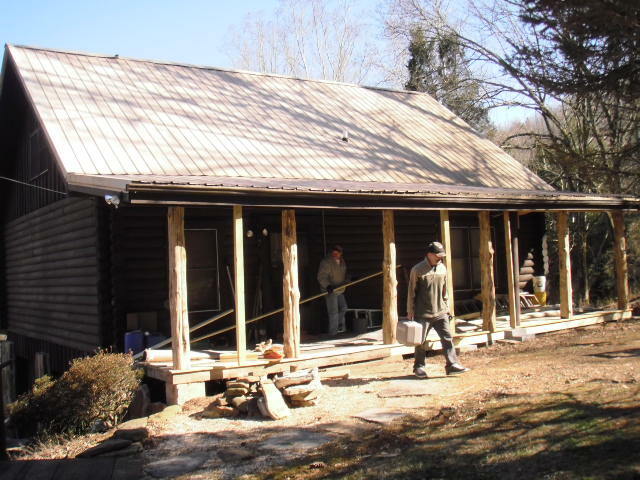 Exterior repairs to historic dwelling. 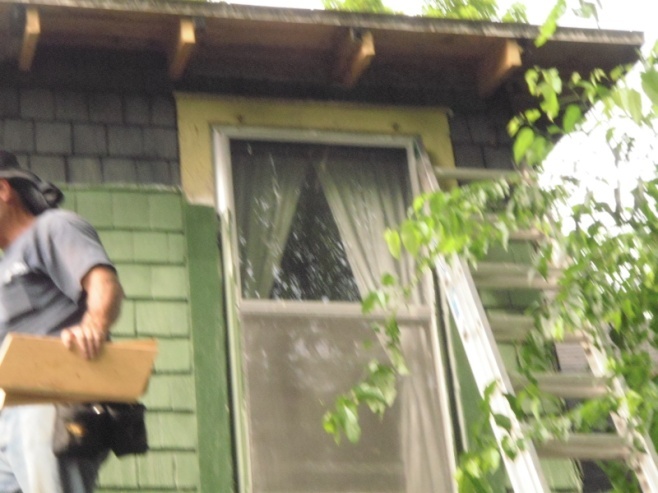 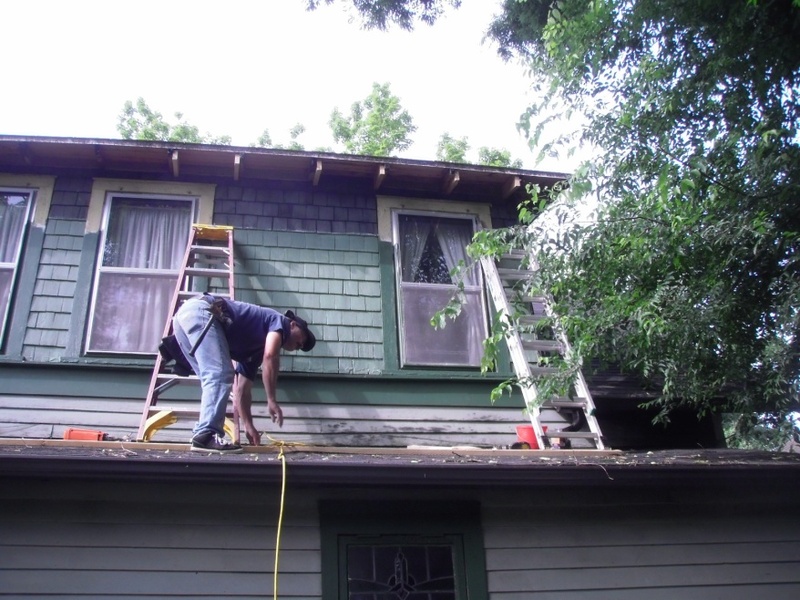 This older home was in need of some exterior repairs, mostly due to water damage. 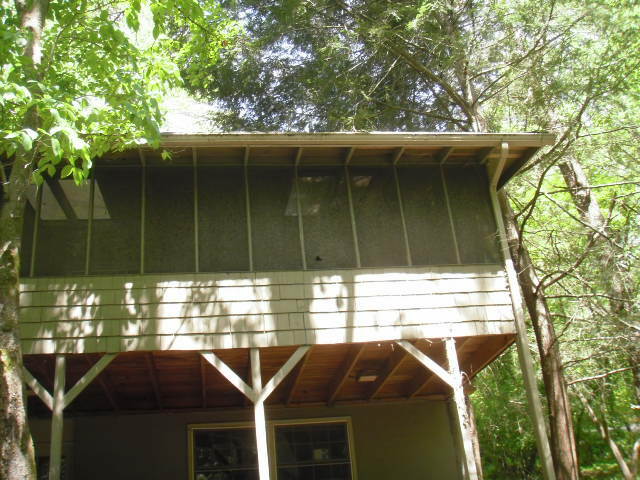 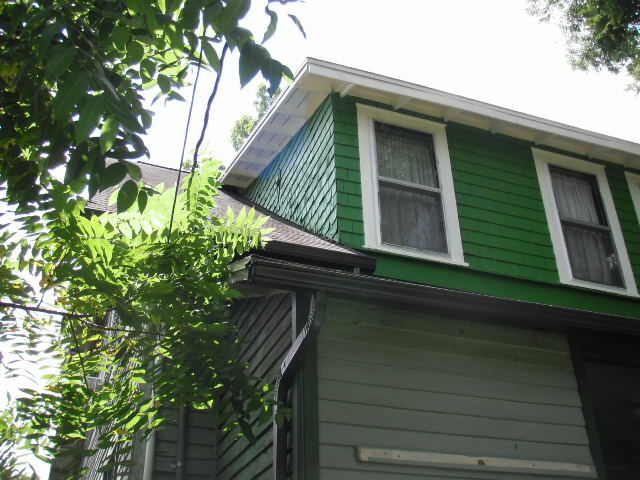 The cedar shake siding was dry rotted and was replaced with new shakes, then painted. 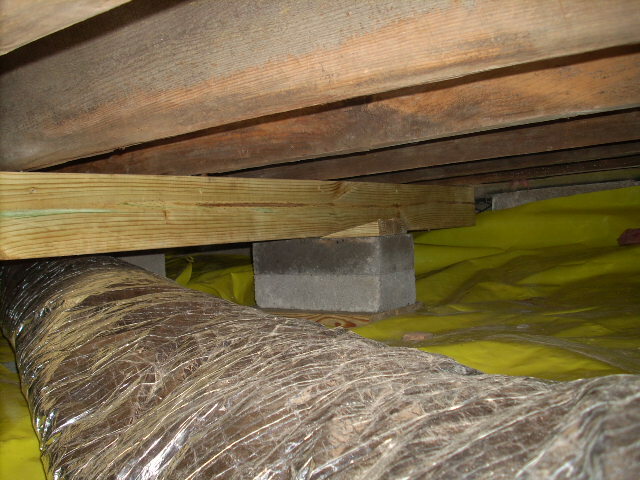 The rafter tails had rotted out and were supplemented by scabbing new 2 x 6 supports to them. 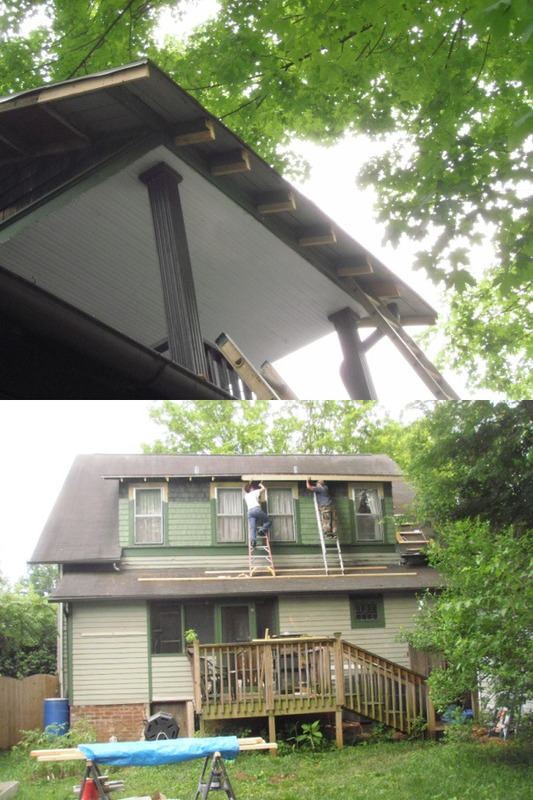 After installing new rafter tails on the front and back sides of the home, fascia board and gutters were installed to provide water management. 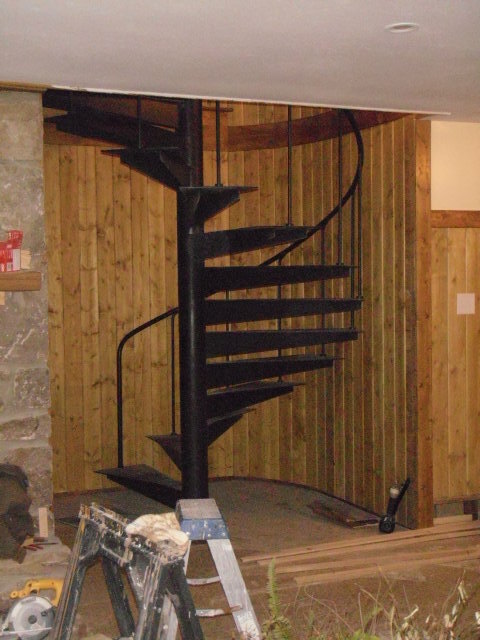 Remodel basement and stairwell. 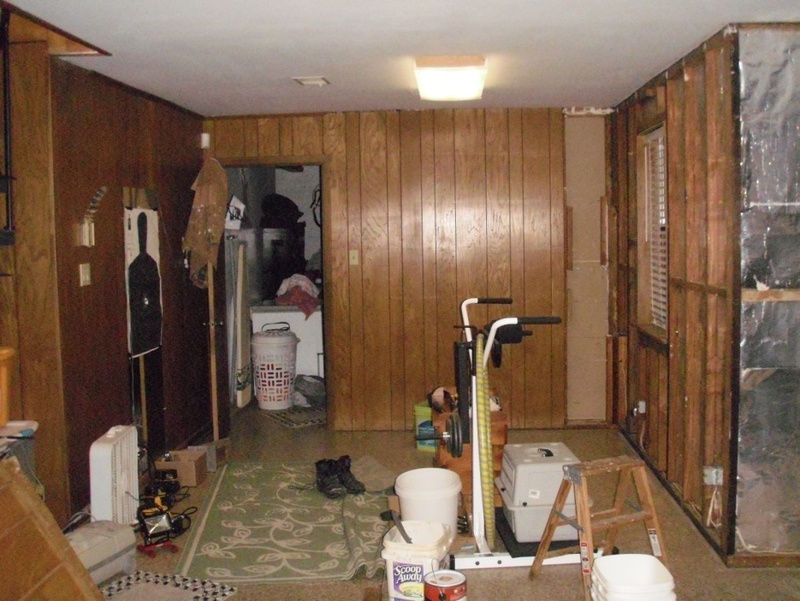 This area of the home was uncomfortable due to a lack of insulation and the paneling had become outdated. 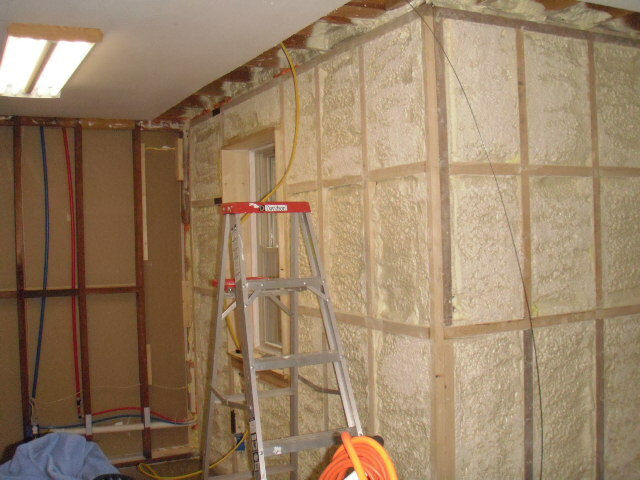 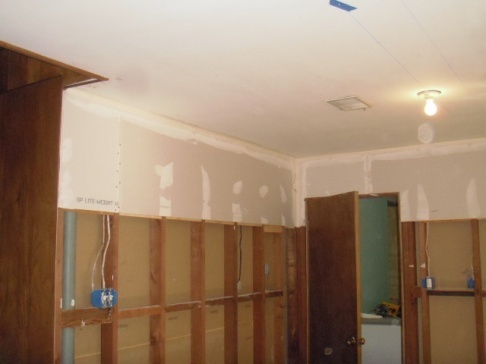 The paneling was removed and the walls were insulated with closed cell spray foam. 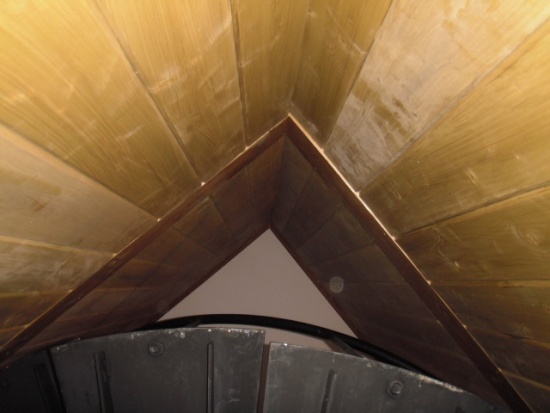 The ceiling was coated with orange peel texture, the upper walls were sheet rocked and painted and the remainder covered with tongue and groove wood. 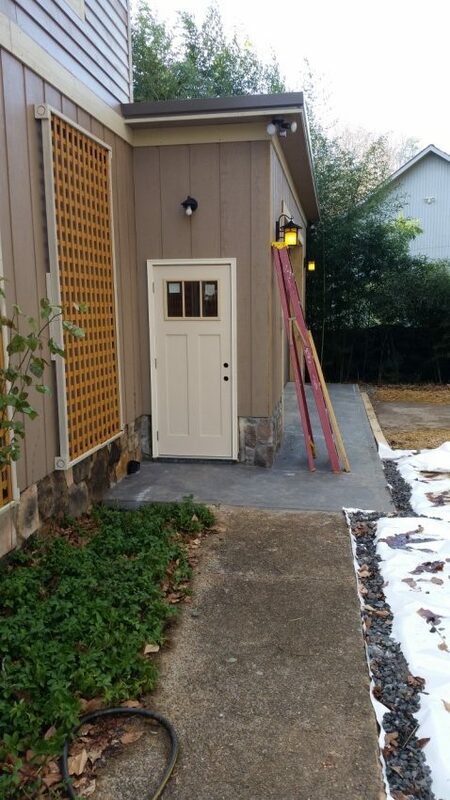 New LED can lights, doors and trim were installed. 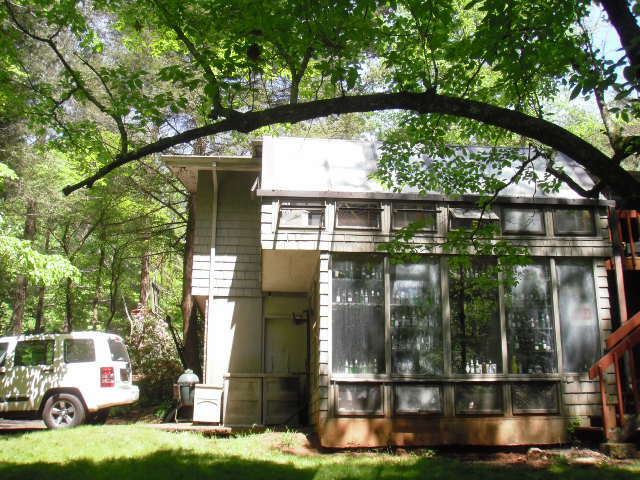 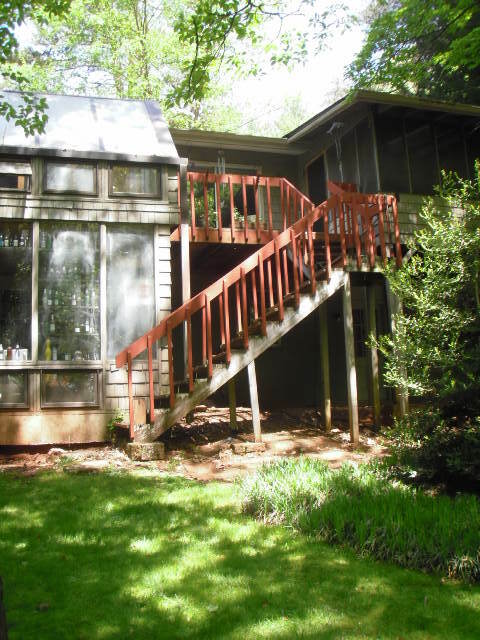 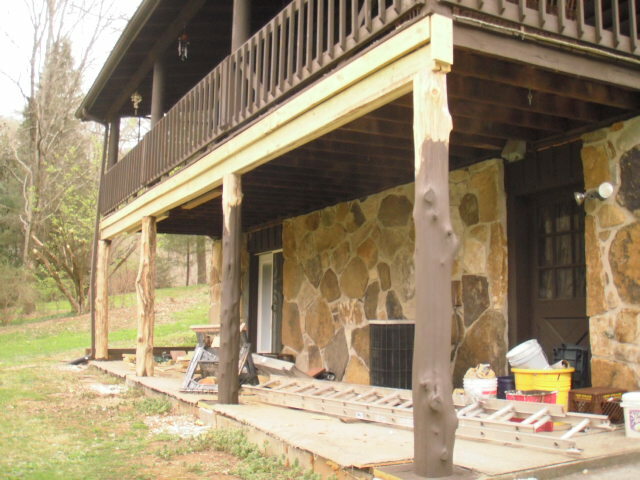 Remove sunroom and deck, build new deck, convert screen porch to sunroom. 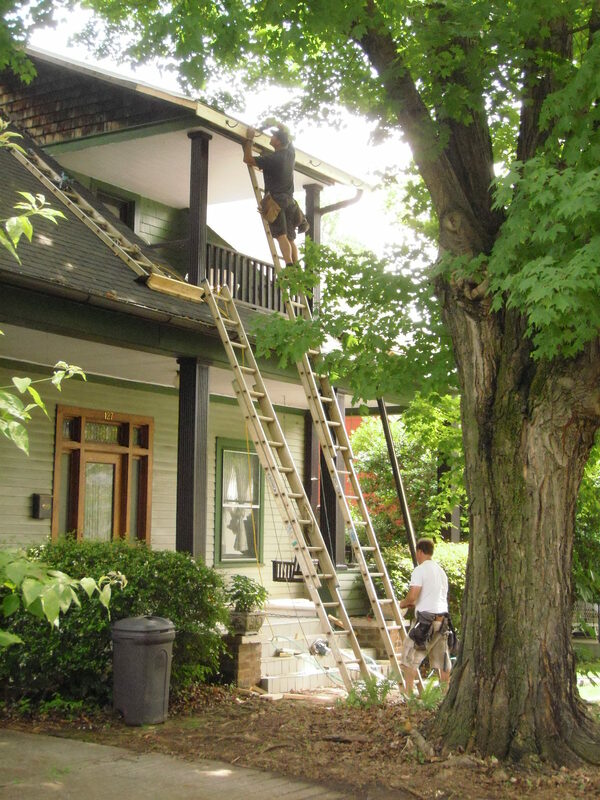 This older home was in disrepair. 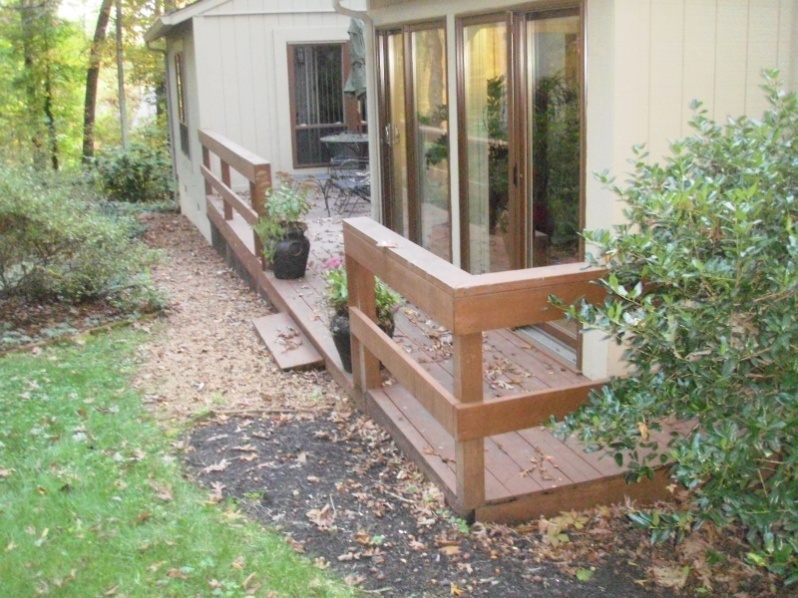 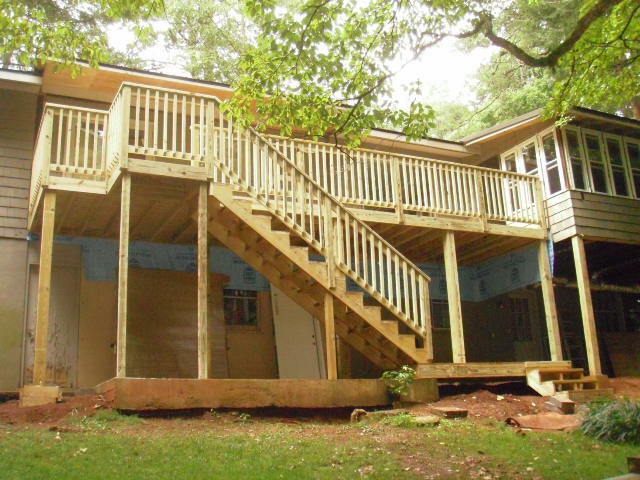 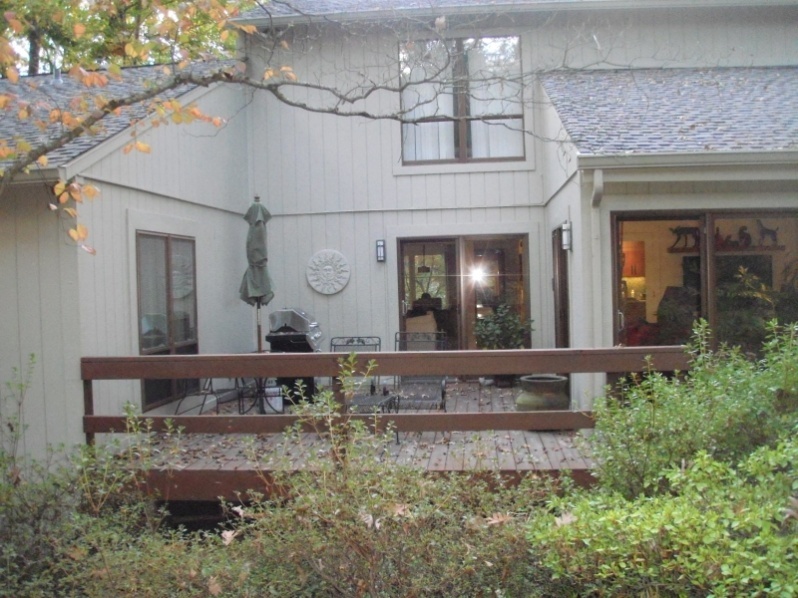 The owner wanted to remove an old sunroom and small deck, and build a much larger deck in the resulting space. 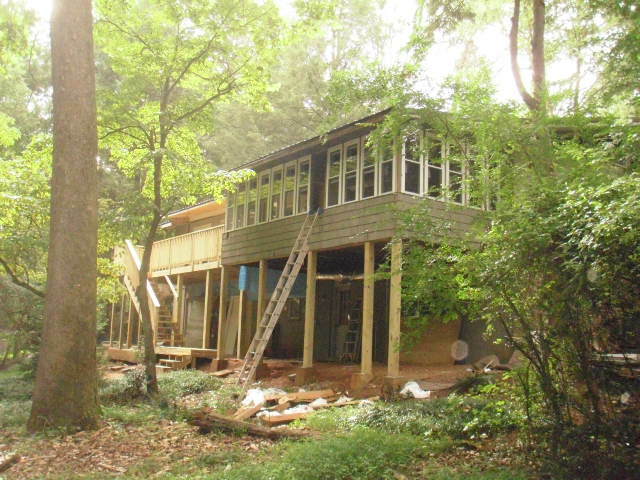 The owner also wanted to convert an old screened porch into a conditioned sunroom. 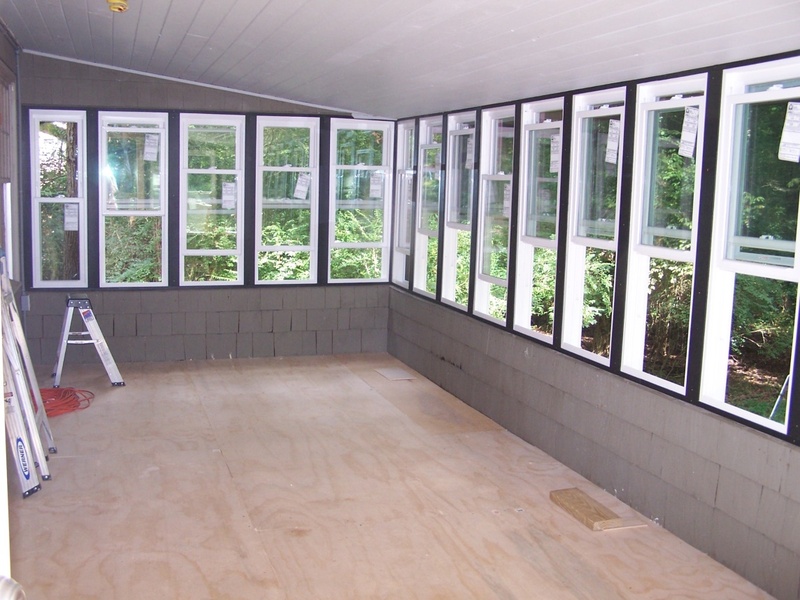 The old sunroom was torn down and the lumber and windows were recycled. 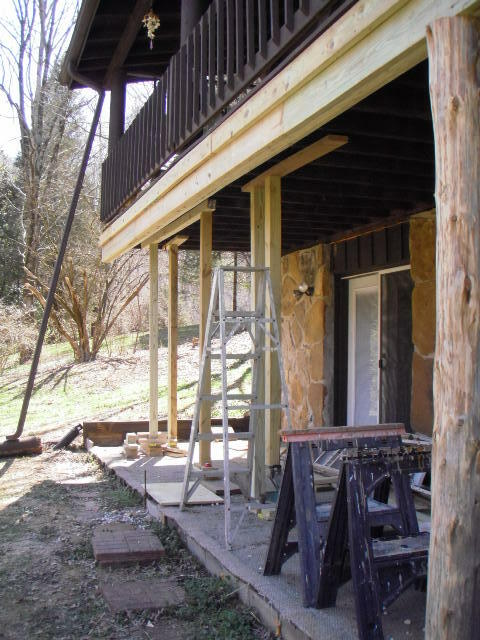 The old supports for the screened porch were replaced with larger supports and framing more appropriate for the intended live and dead loads of the conditioned sunroom. 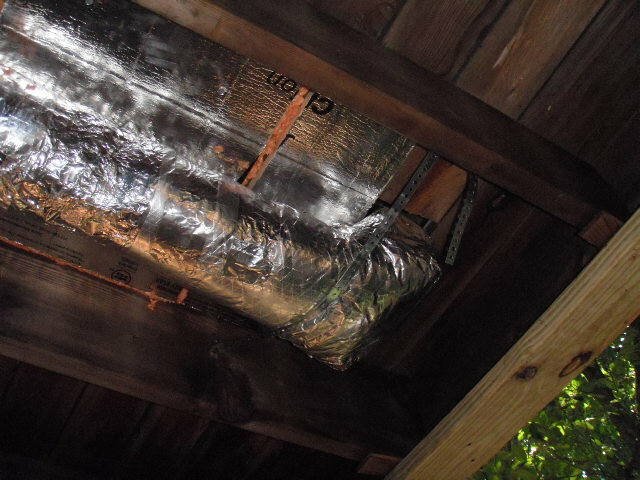 Ductwork was run to the porch, to condition the space once it was enclosed. 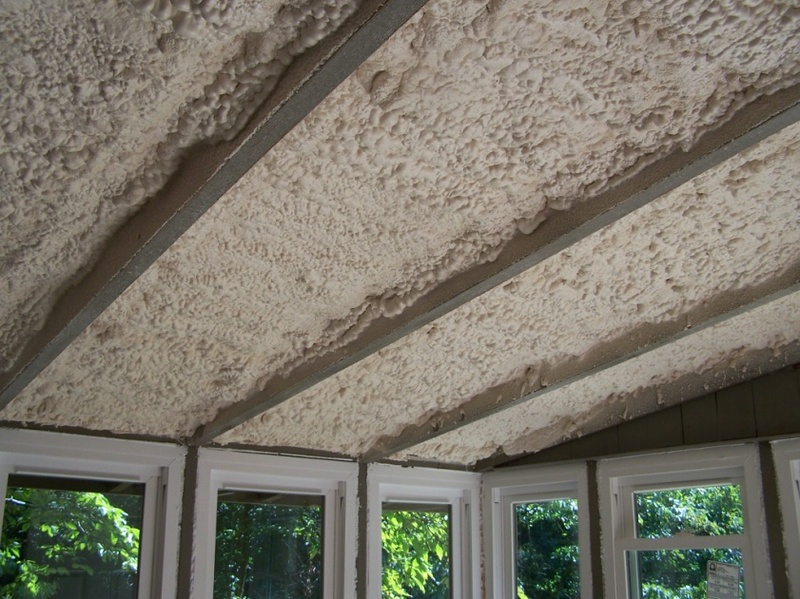 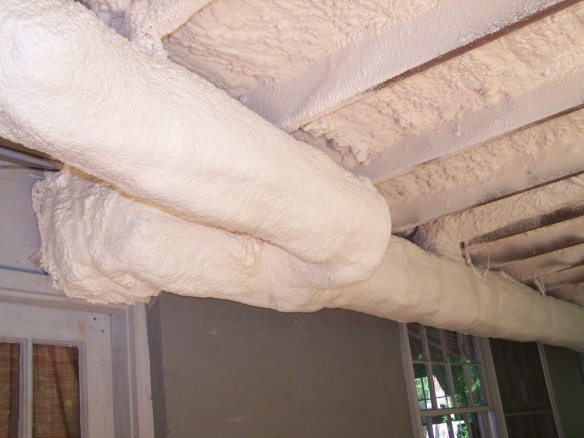 Spray foam was used to encapsulate the ductwork, the underside of the porch floor, and the porch roof deck to provide insulation. 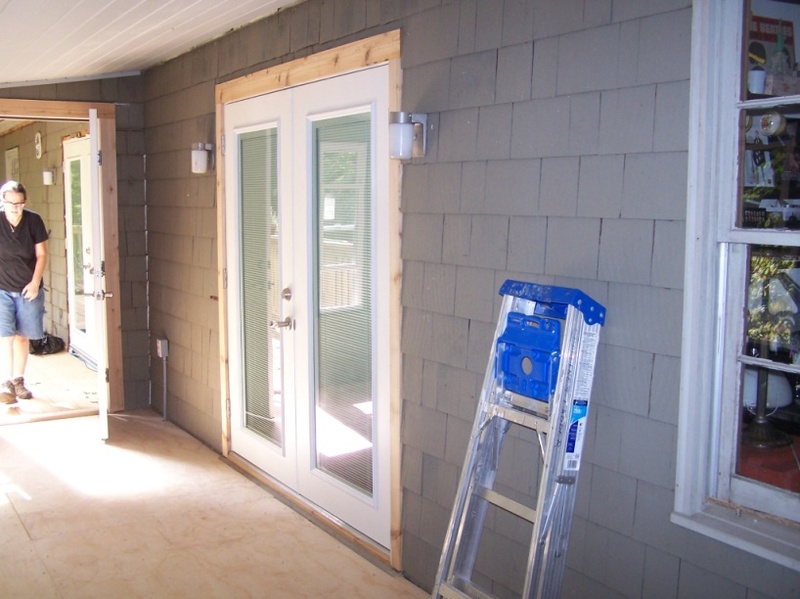 ENERGY STAR windows and doors were installed. 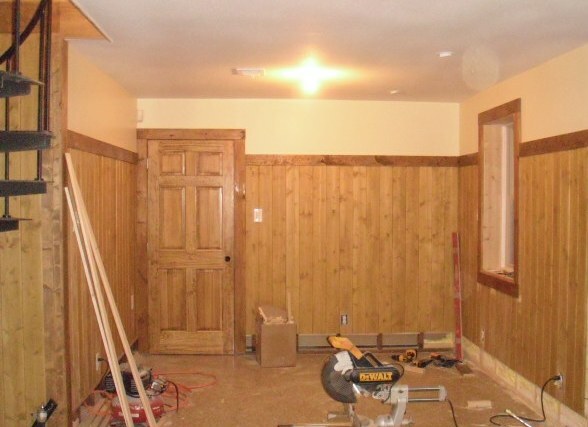 The ceiling was finished with tongue and groove pine boards and the windows were trimmed out. 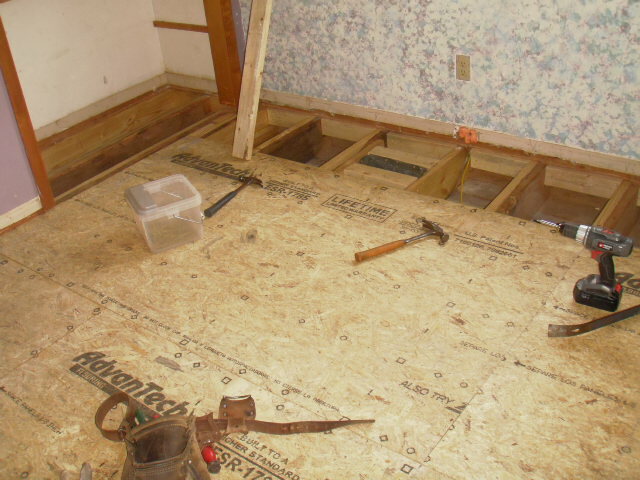 Plywood sheeting was laid over the open deck boards in preparation for a tile floor. 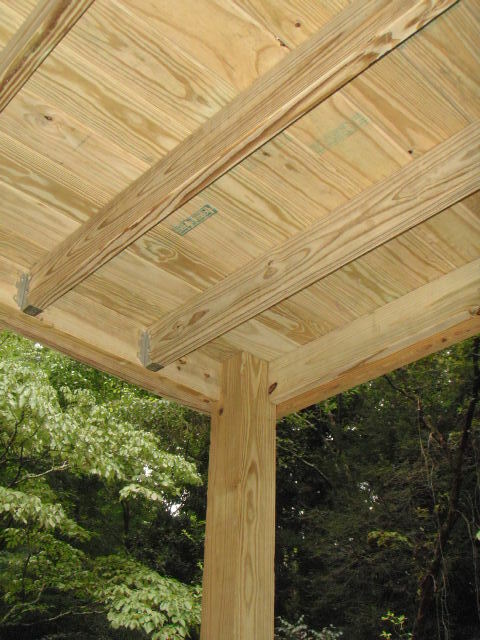 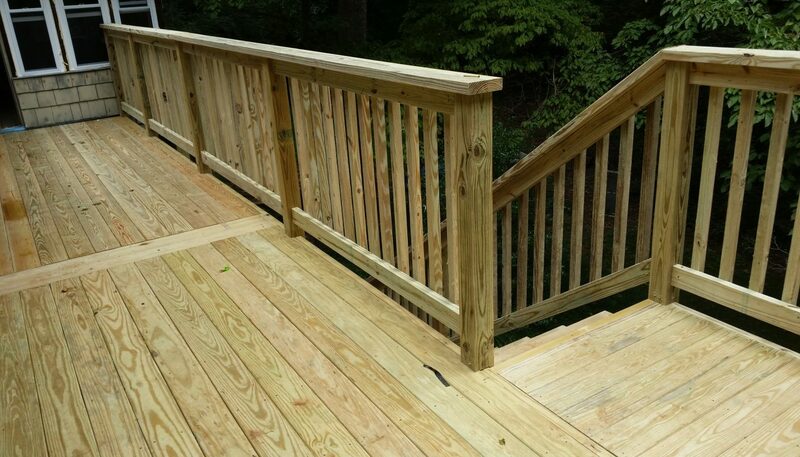 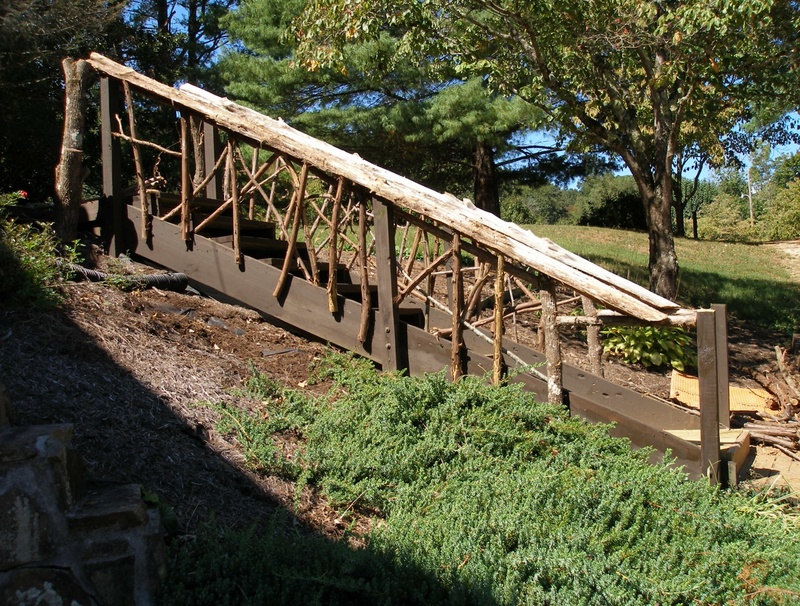 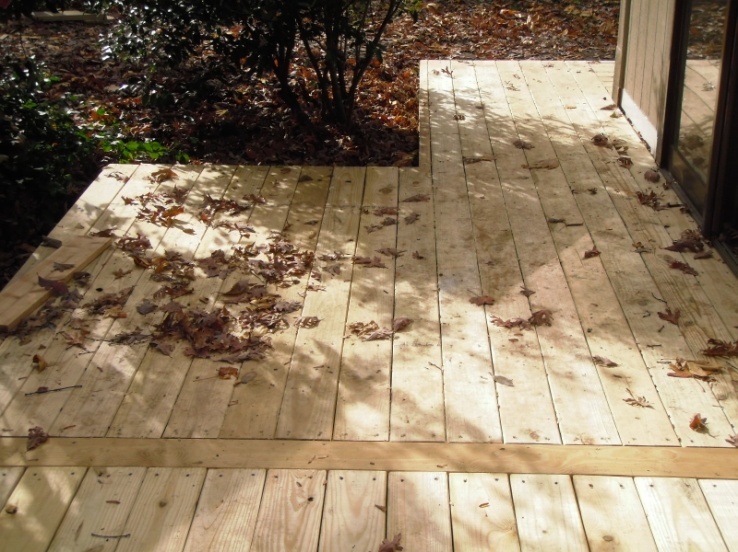 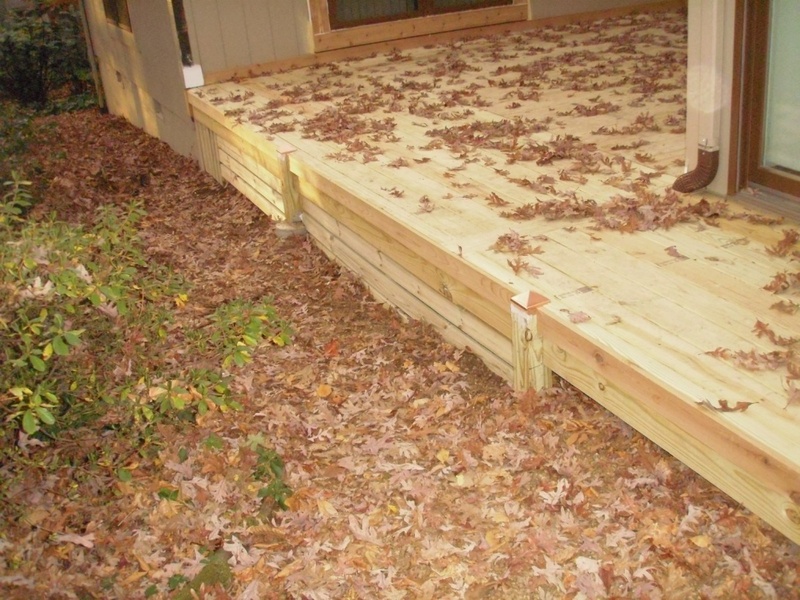 Top-quality pressure treated lumber was used to construct the new deck. 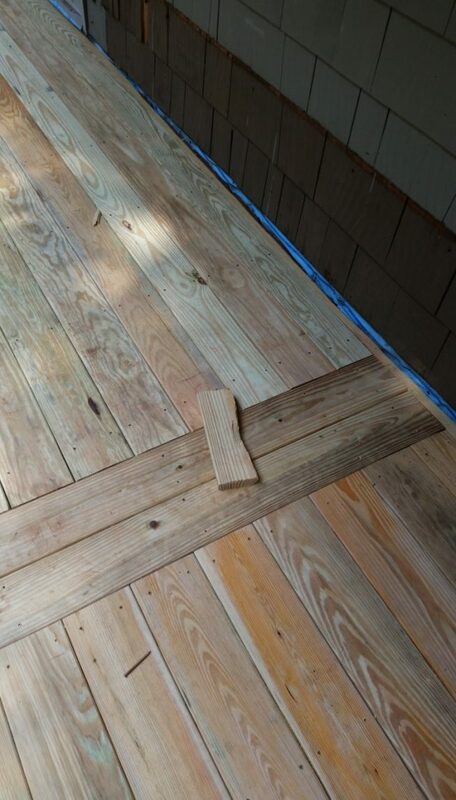 The deck boards were fastened with screws rather than nails to prevent them from backing out over time. 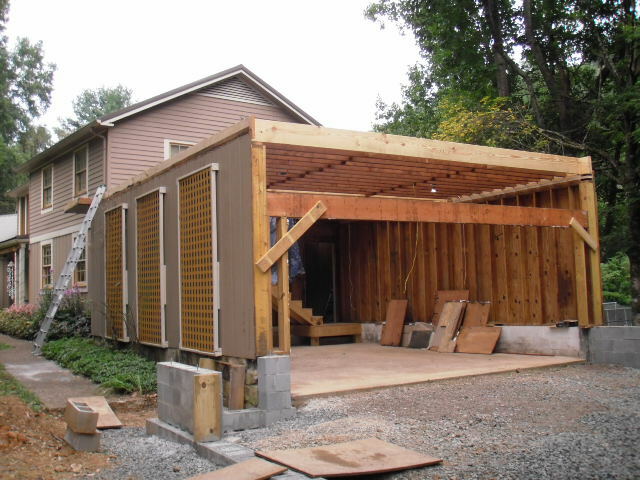 Garage Addition. 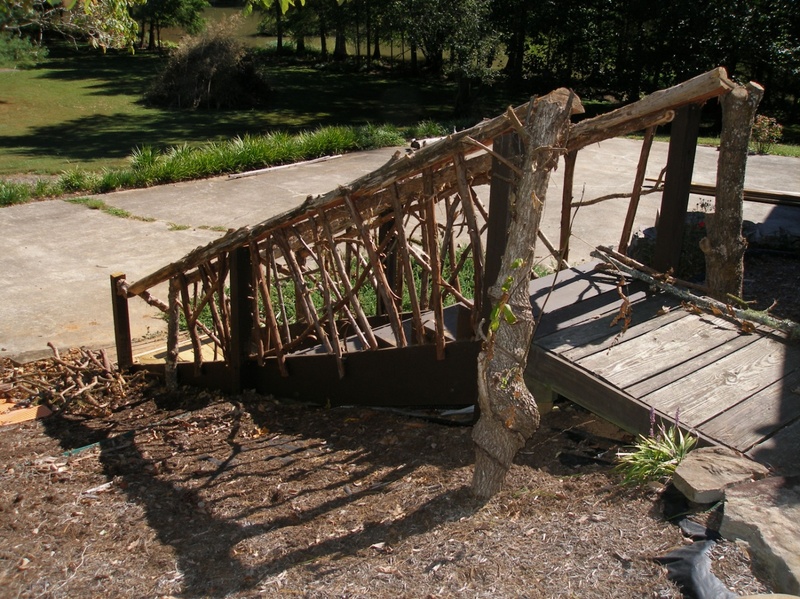 This garage had been damaged by trees falling during a storm. 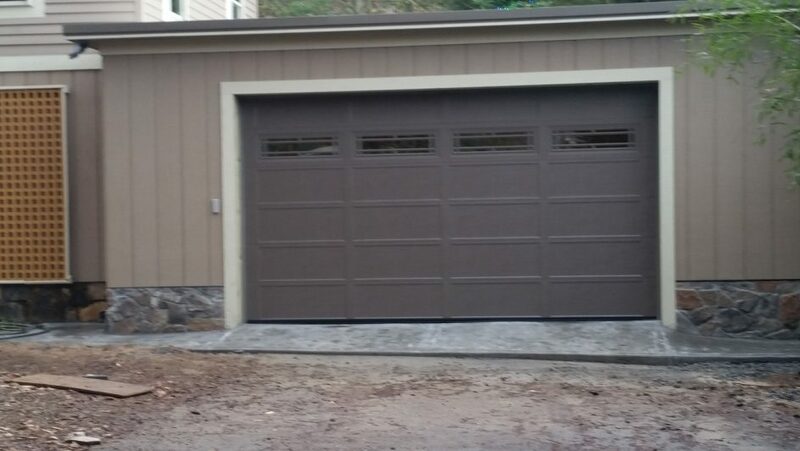 Instead of repairing it, the owner decided to build an addition over the old garage and add a new garage beside the old one. 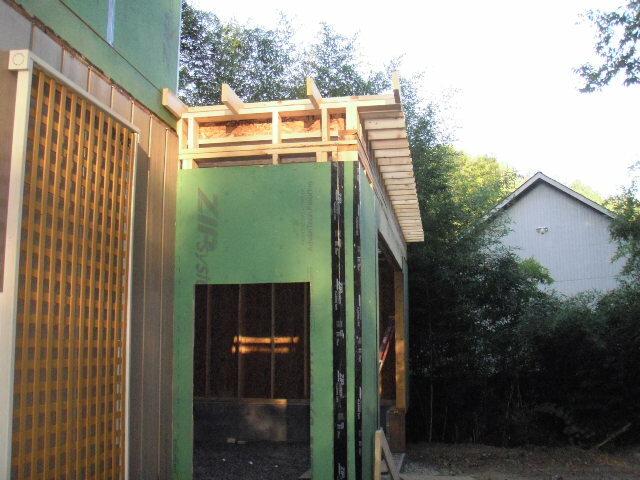 A primary design objective was to use energy-efficient methods and materials during the construction process. 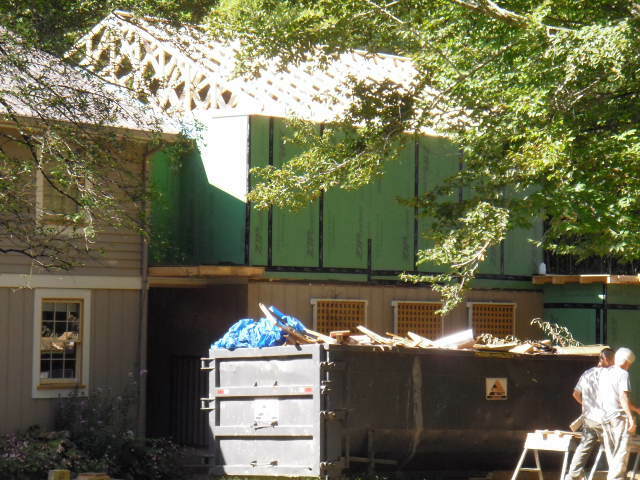 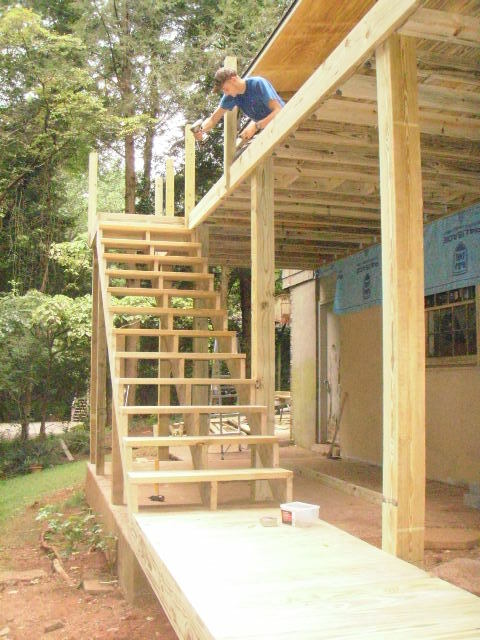 During the first phase, the old garage roof deck and soffit were removed, the ceiling framing was made level (the old roof sloped for drainage), stairs were added, and a subfloor was installed. 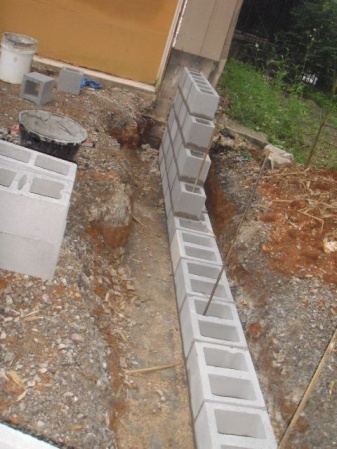 The foundation was prepared for the new garage. 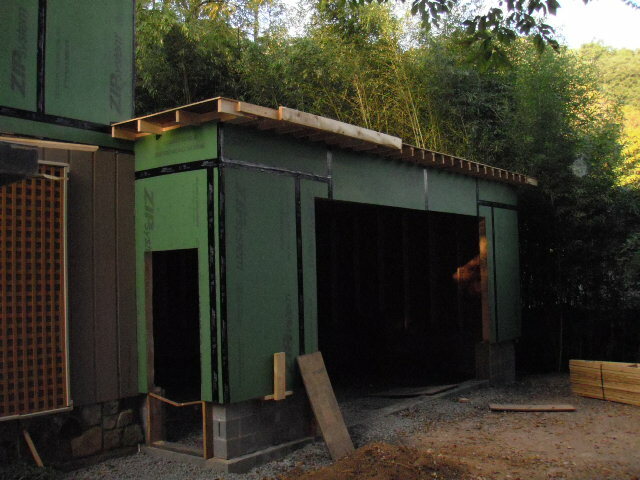 The new garage was framed out next using 2 x 6 stud walls at 24 inches on center and BLI joists. 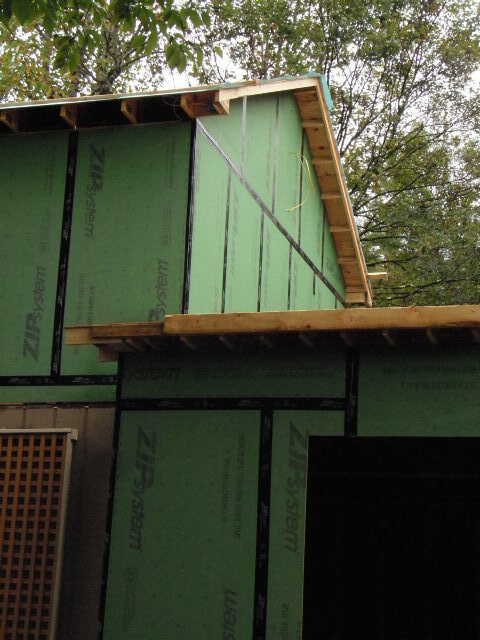 The ZIP board used for sheathing contained recycled materials and had a water-proof coating, eliminating the need for house wrap. 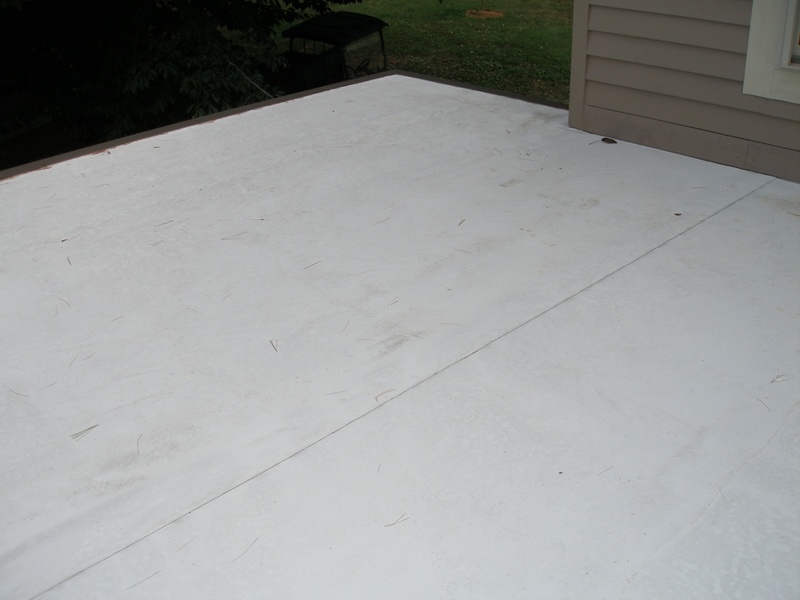 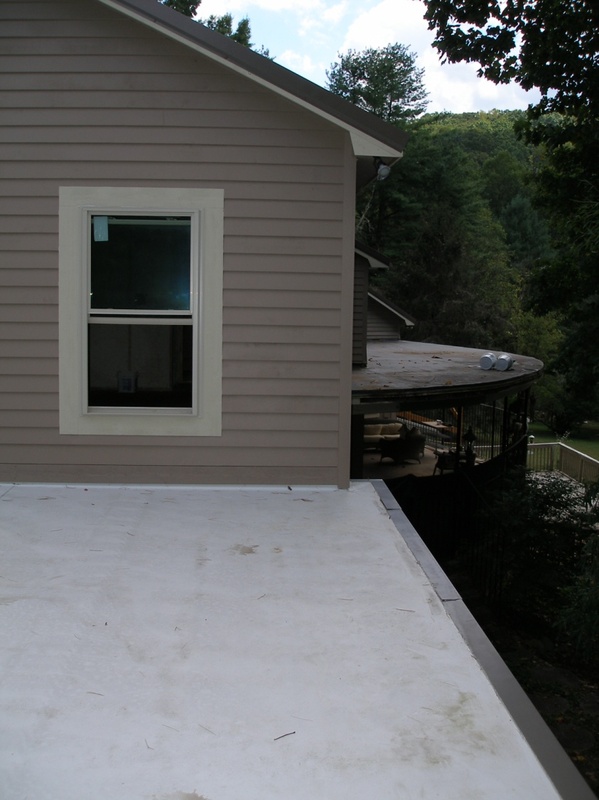 The flat roof (1% slope) was created using ZIP board and covered with TPO, a durable, energy-efficient product. 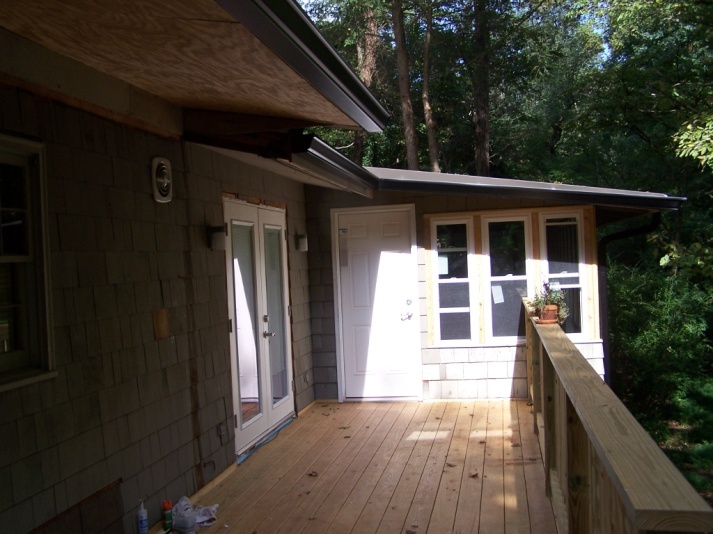 Pre-painted cedar board and batten panels, lap siding and trim and ENERGY STAR vinyl windows were installed, closely matching the existing architectural features of the home. 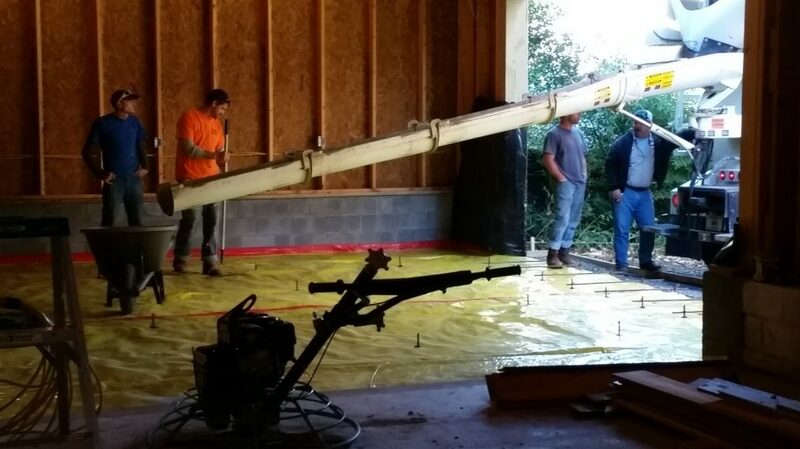 A concrete slab was poured for the garage floor and an insulated 9 ft x 16 ft steel roll up door was installed. 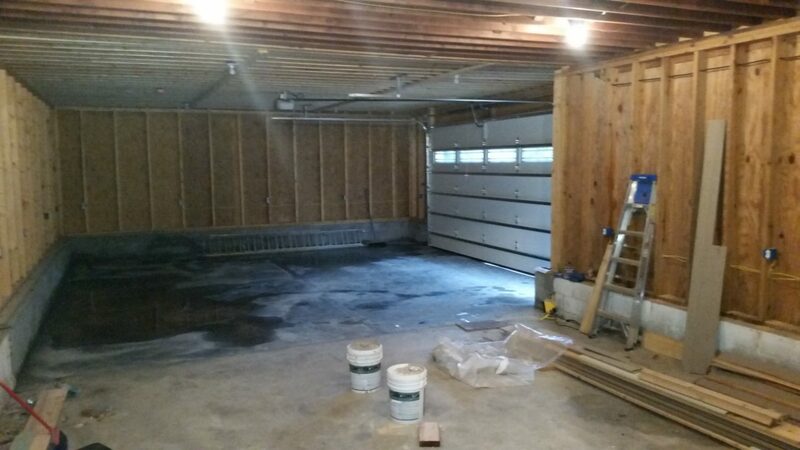 The new garage allows for two vehicles plus some storage and has enough clearance to allow for vehicles with ladder racks and ladders. 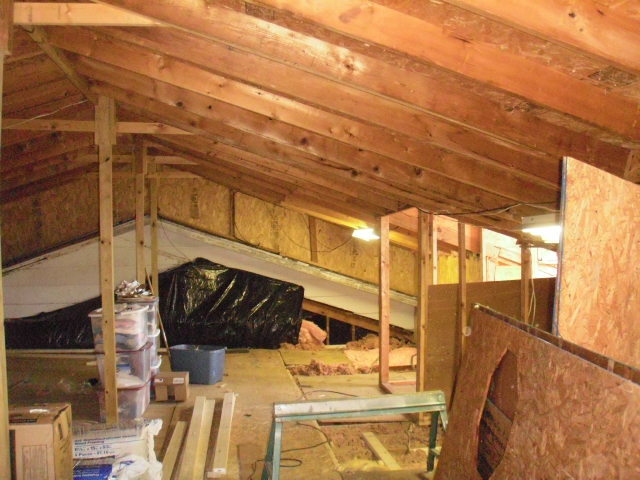 Finally, the second story over the old garage was framed out using 2 x 6 stud walls at 24 inches on center and raised heel energy trusses. 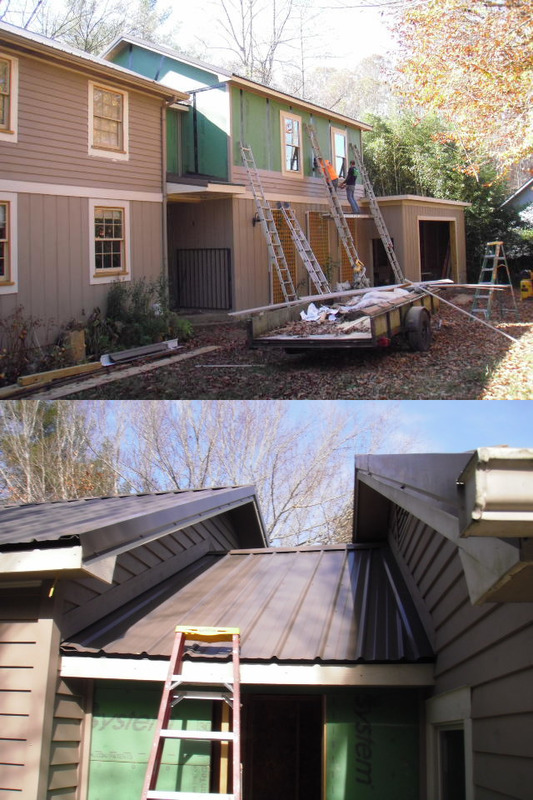 The roof slope was matched to the existing dwelling and a small connector section was built to join the old and new areas. 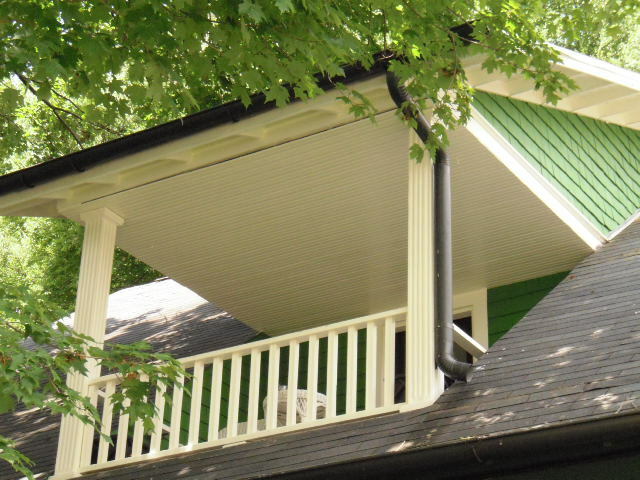 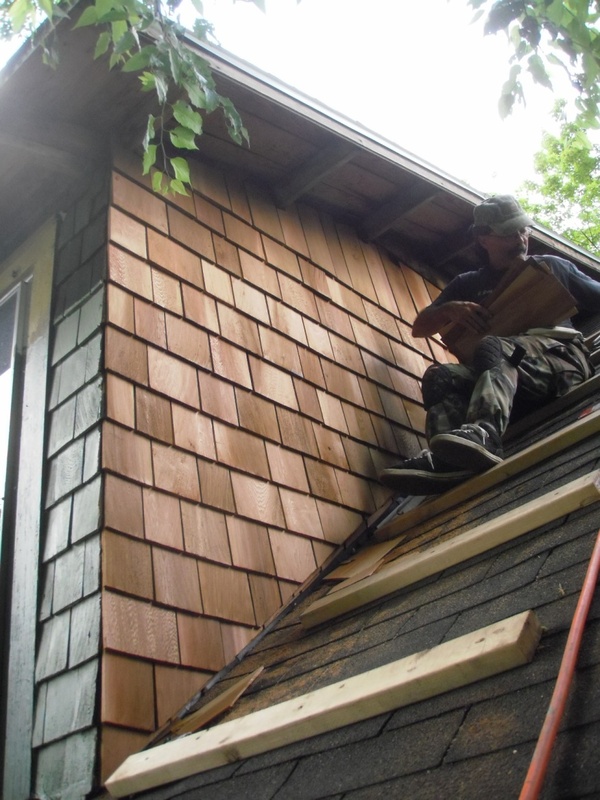 No ridge, gable, or soffit ventilation was installed because the roof deck was to be insulated with spray foam and lightly conditioned, to create a more energy-efficient space, rather than using more traditional methods. 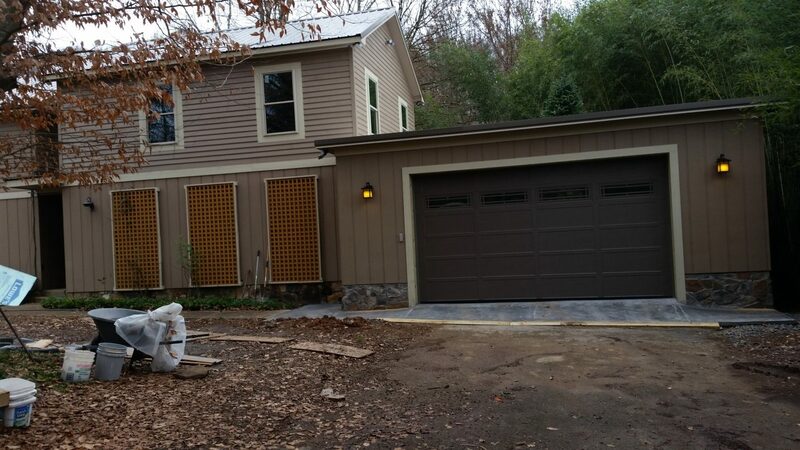 The final product-a 760 sf second story addition with an ENERGY STAR metal roof and a 680 sf garage. 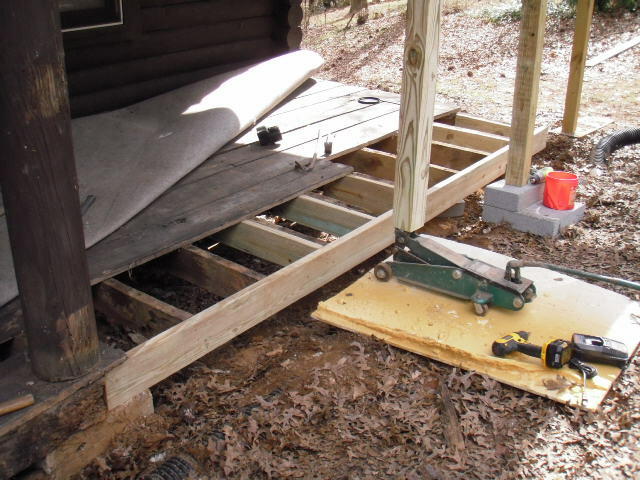 Replace subfloor and add supports. 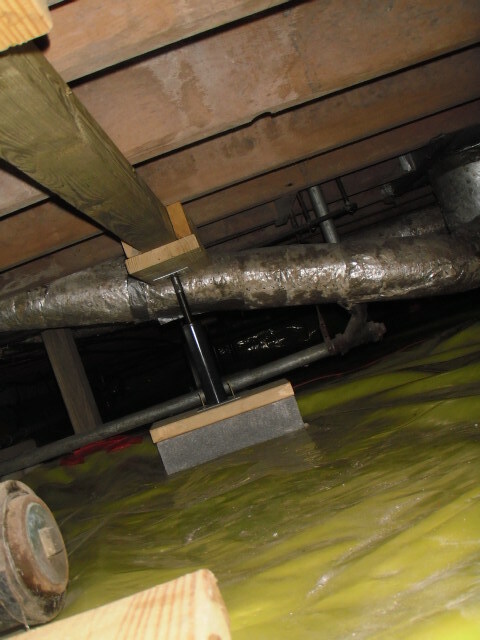 This home had a crawl space with no vapor barrier. 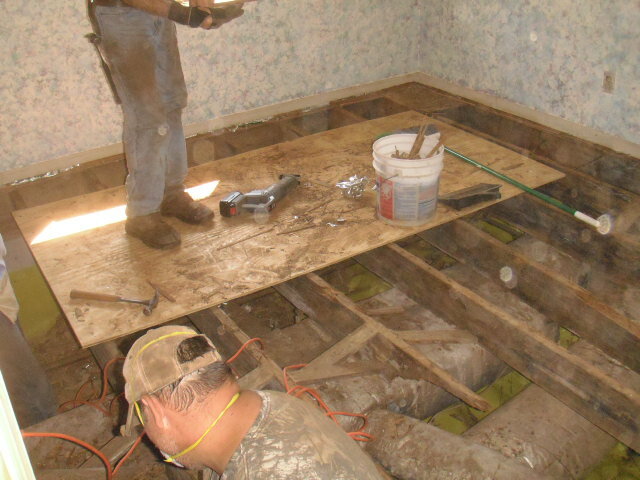 Over the years, soil moisture had encouraged mold growth on the framing members and subfloor, resulting in severe structural damage. 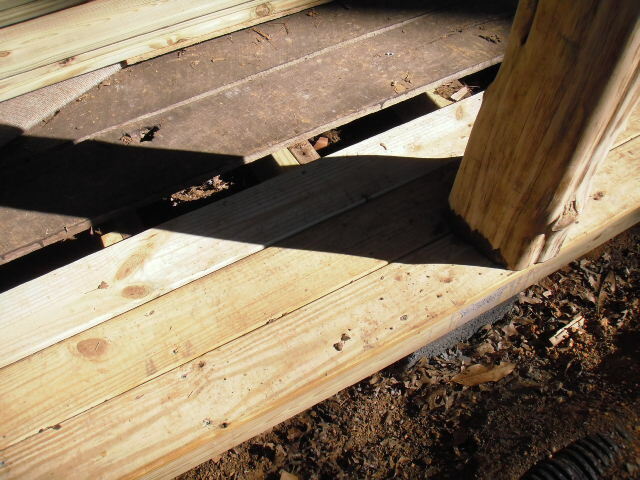 The subfloor was no longer able to support any weight and many of the floor joists were collapsing. 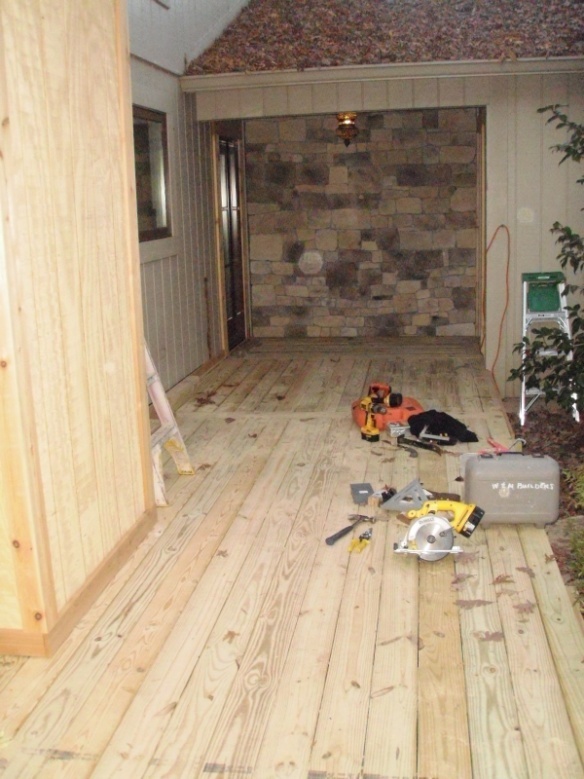 The finished floor, subfloor and framing had to be removed and new materials installed. 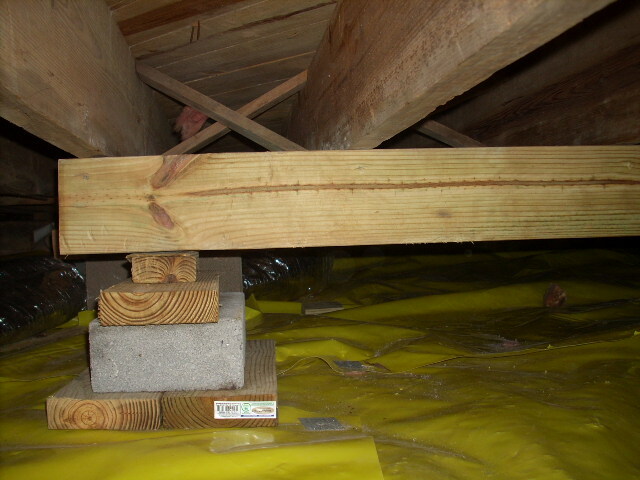 A heavy-duty vapor barrier was also installed. 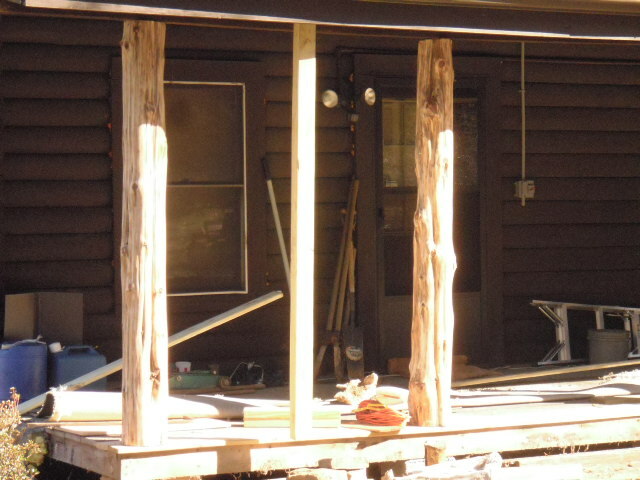 New Supports at Cabin. 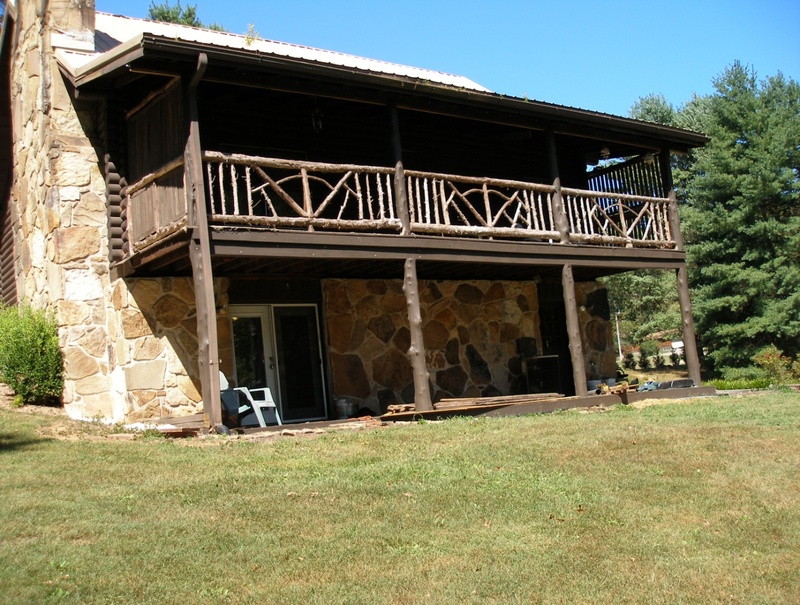 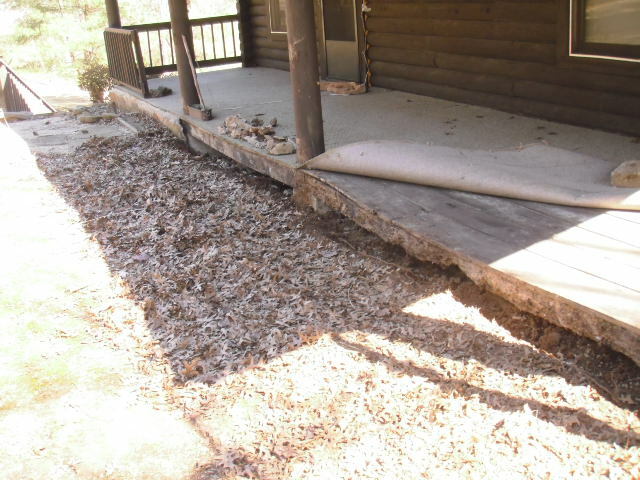 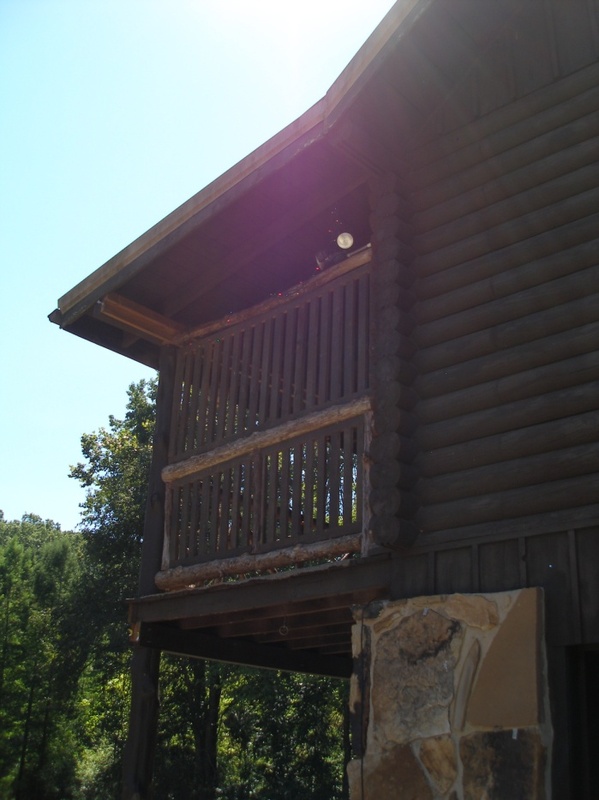 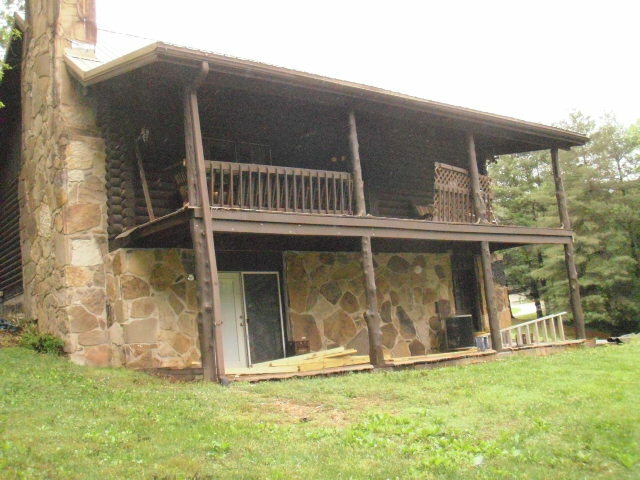 This log cabin had structural damage due to prolonged exposure to water. 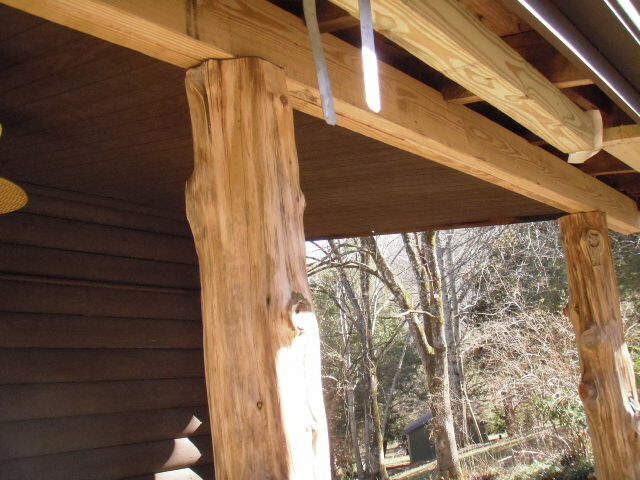 The support posts for the porches were rotted and unable to hold the weight of the overlying roof. 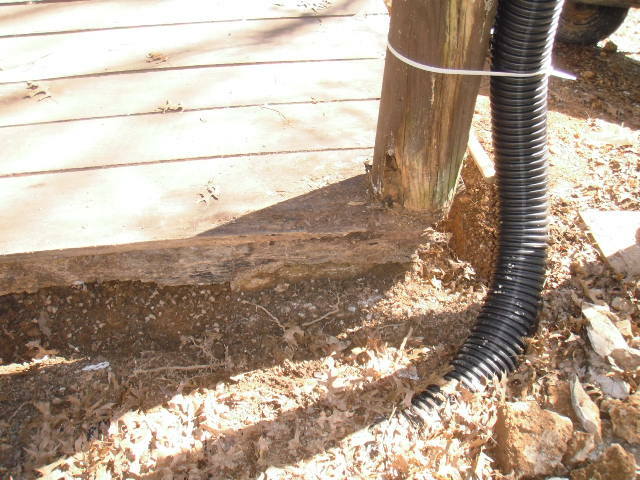 In addition, there were no footers under them, the floor joists were damaged and the rough oak planking was in need of replacement. 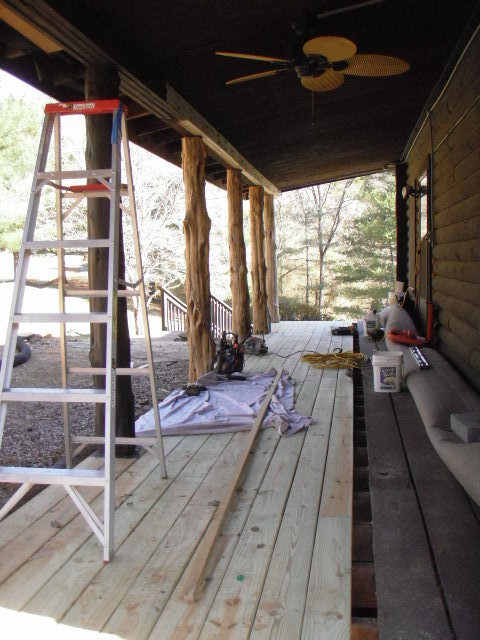 The roof areas were braced and jacked up a few posts at a time, allowing for their replacement. 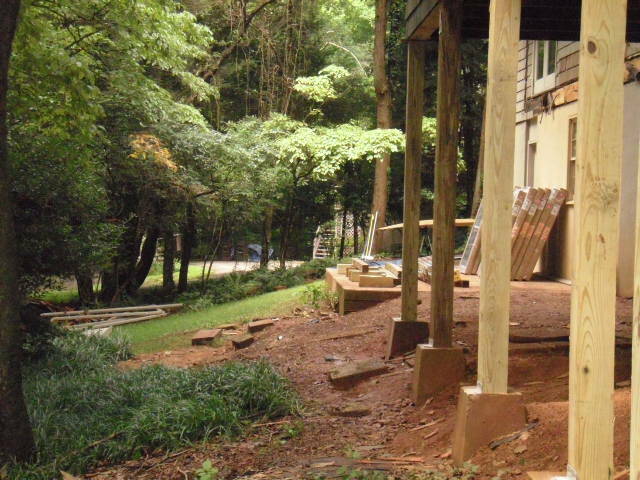 Footers were dug and poured at the same time. 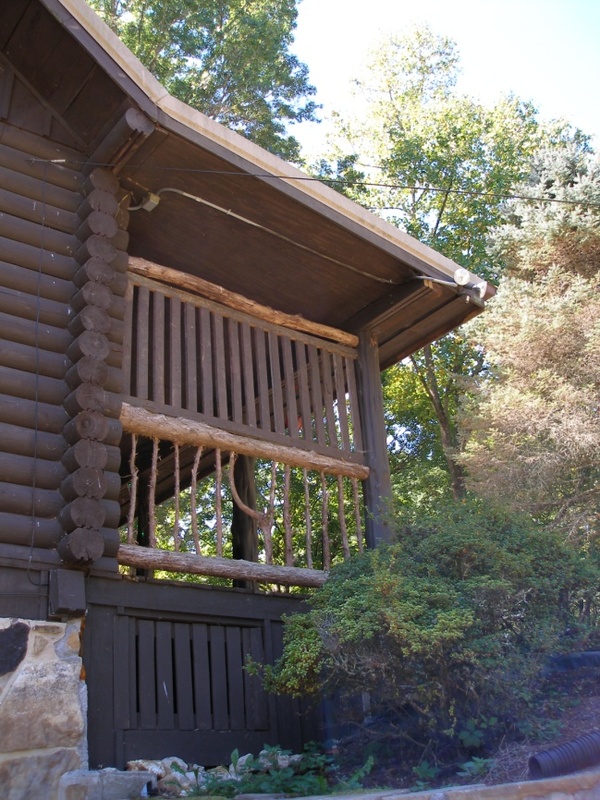 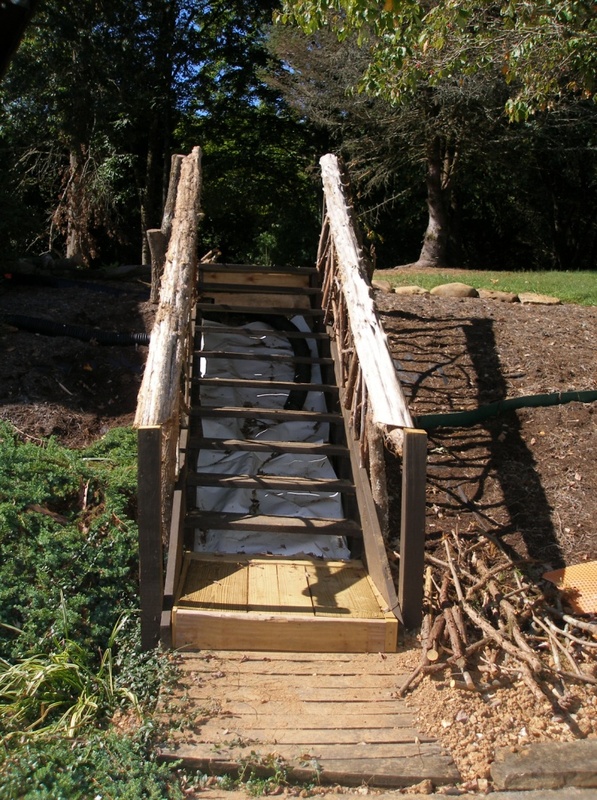 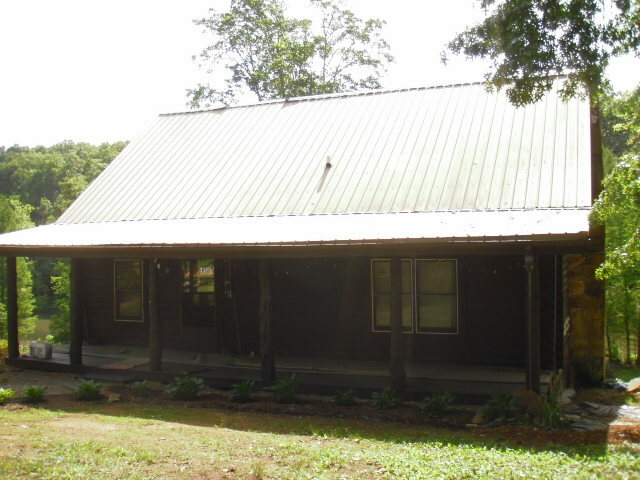 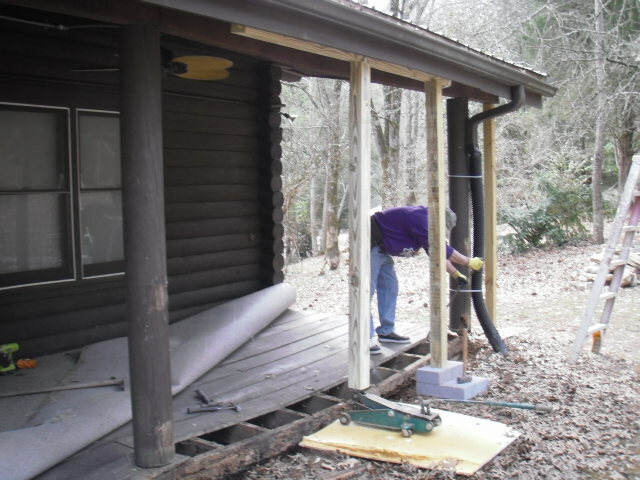 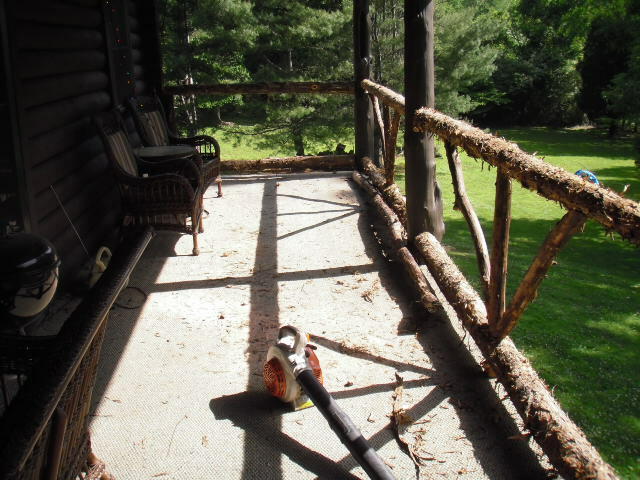 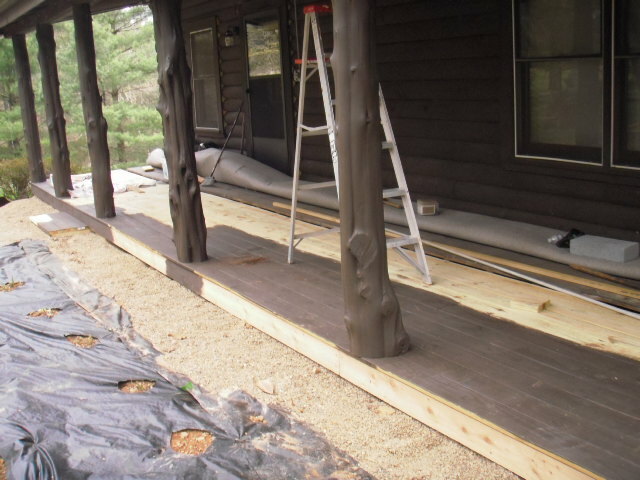 Instead of farm poles, which were used originally, cedar trees were used after being debarked by hand, to give the cabin a more natural appearance. 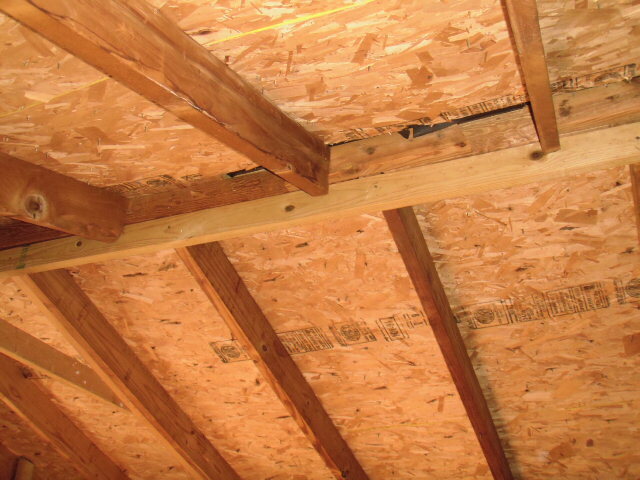 New floor joists were installed and the planking was replaced with treated lumber. 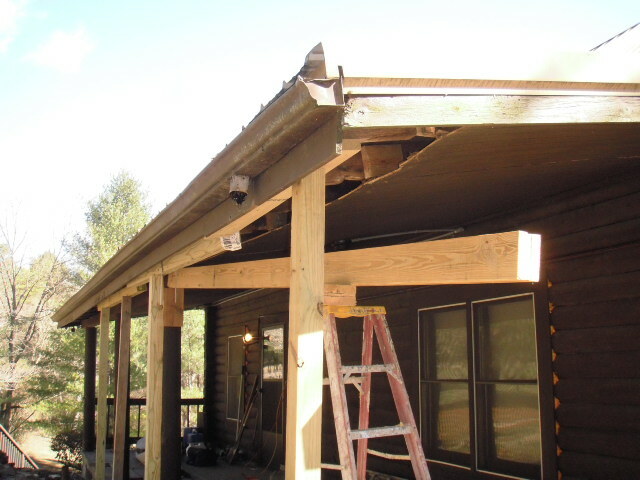 New header beams were also installed in places. 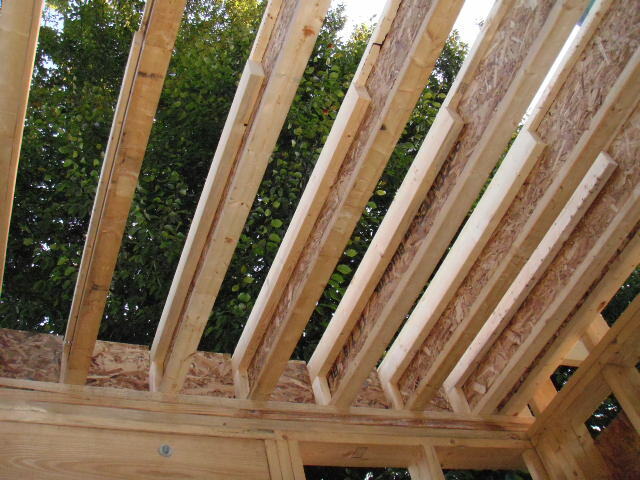 Floor bracing. 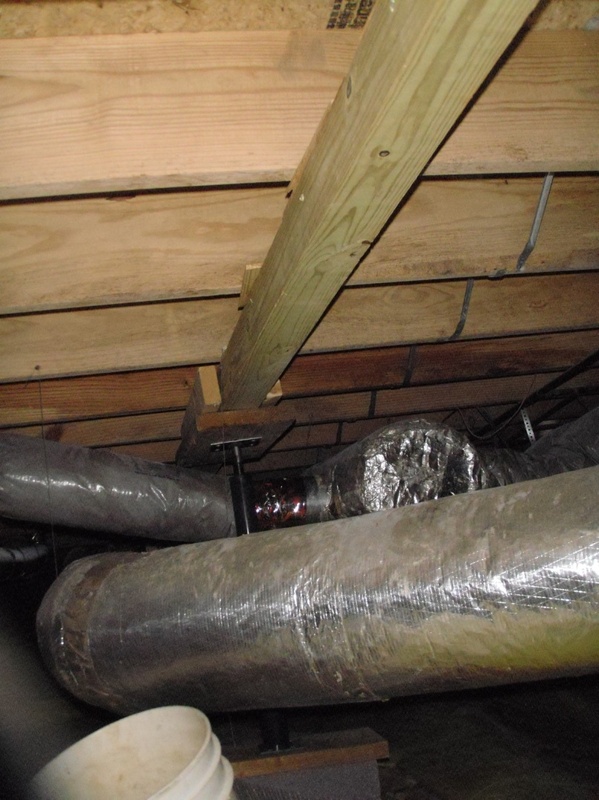 This home had unstable floor joists due to a lack of support beams. 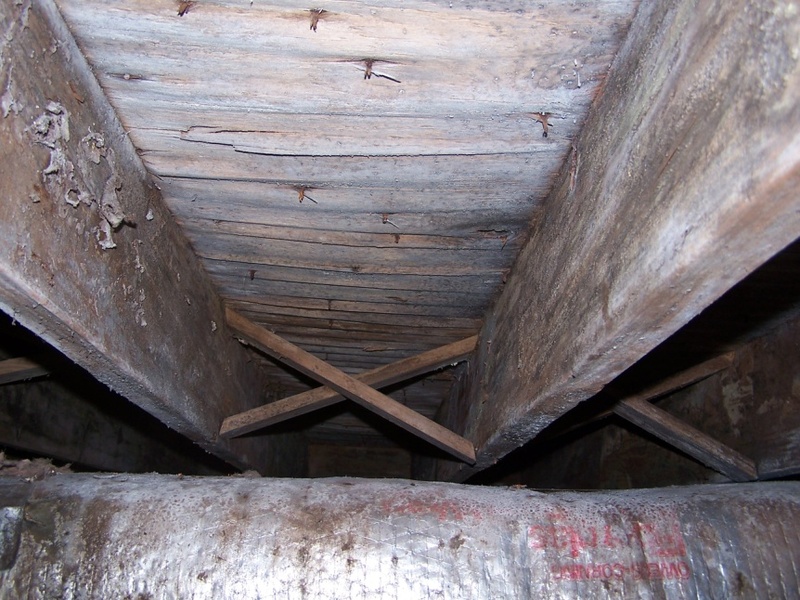 Beams were added where needed, supported on cap blocks. 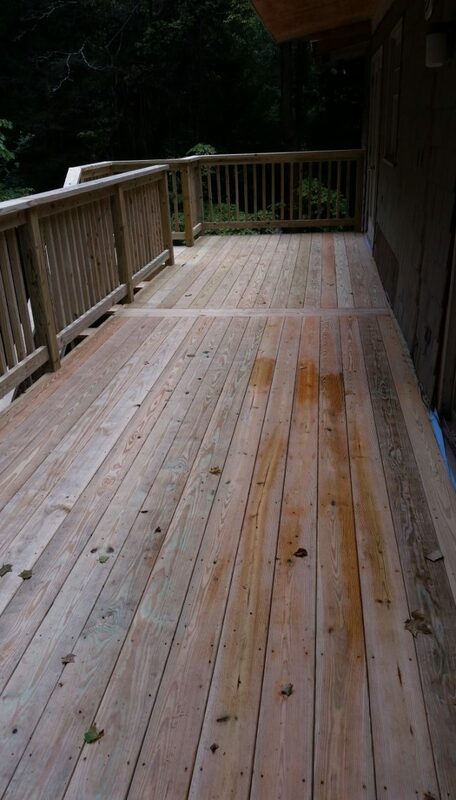 Deck remodel. 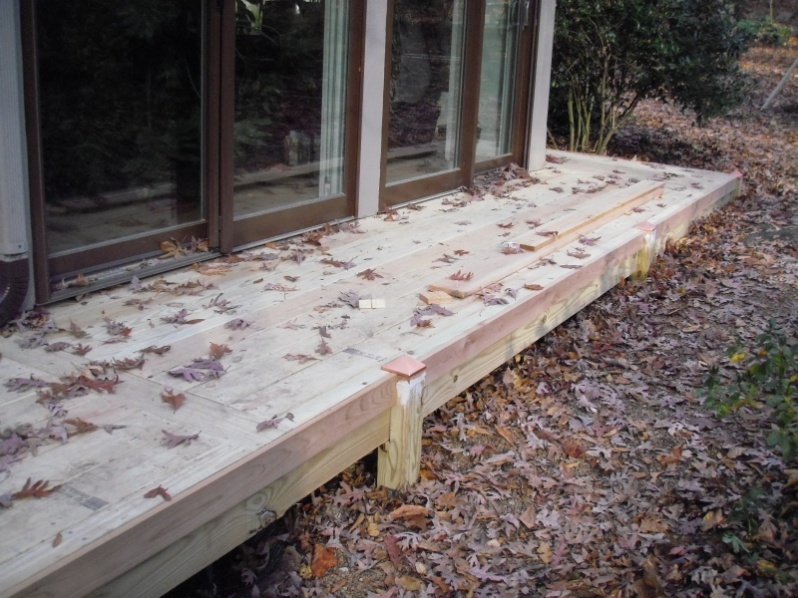 This deck was failing due to lack of flashing at the sidewalls, resulting in rotten siding and deck supports. 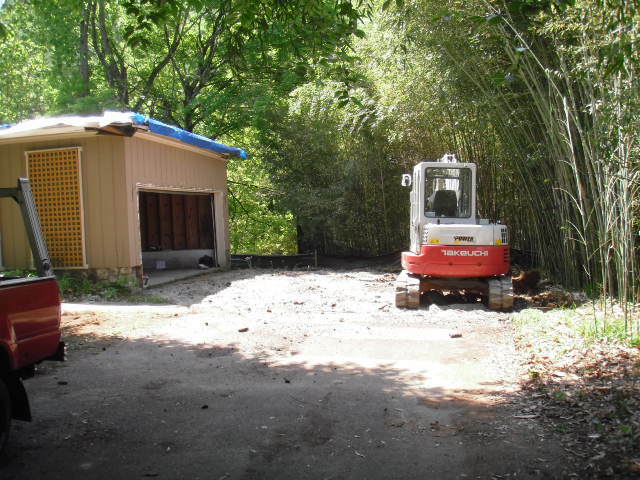 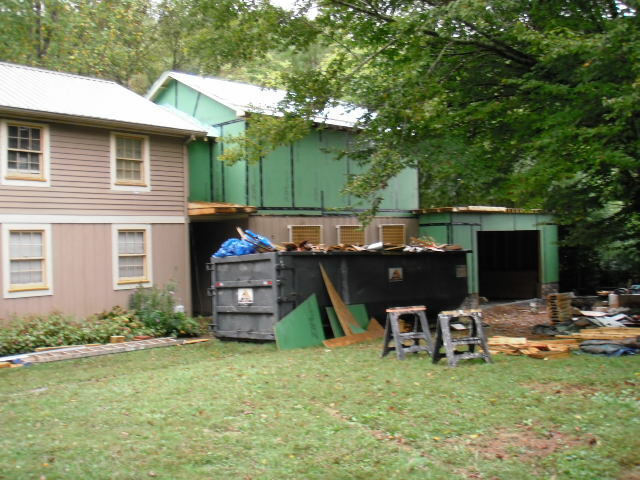 The owner wanted to rebuild it and extend it around one additional side of the house. 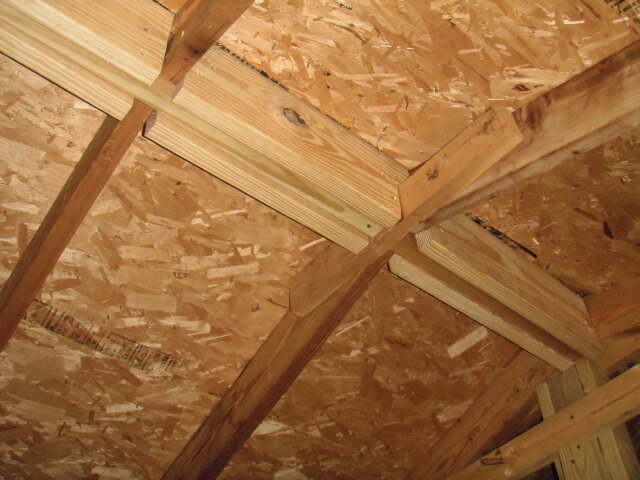 Floor bracing. 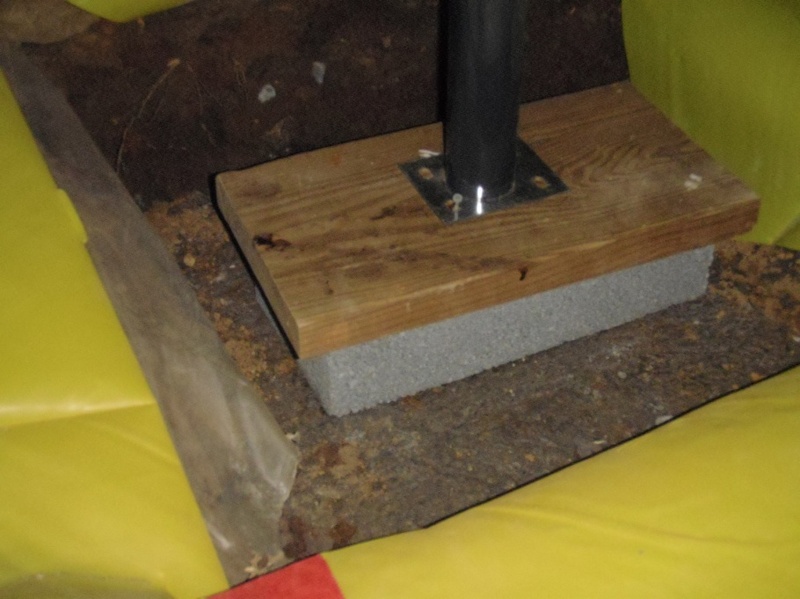 This customer had several rooms in his home with ‘bouncy’ floors due to inadequate bracing. 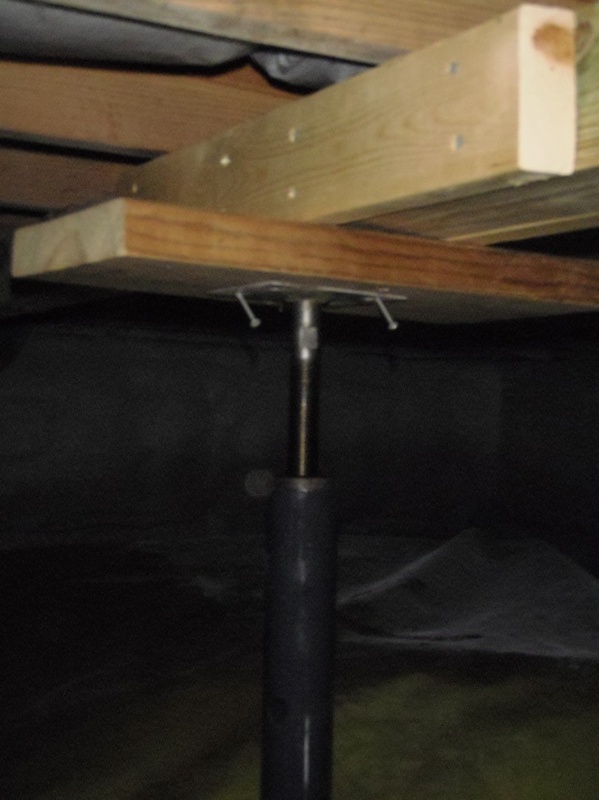 Floor jacks and braces were added to take care of this problem.